Snuffle mats are a great source of enrichment for dogs, especially those that are high energy and need extra mental stimulation. They're also a great indoor activity to keep your dog busy on rainy or cold days when walks might be shorter than usual. Snuffle mats are also great to use in place of a regular dog bowl for meal times, as they prevent dogs from eating too fast and gulping down their food. 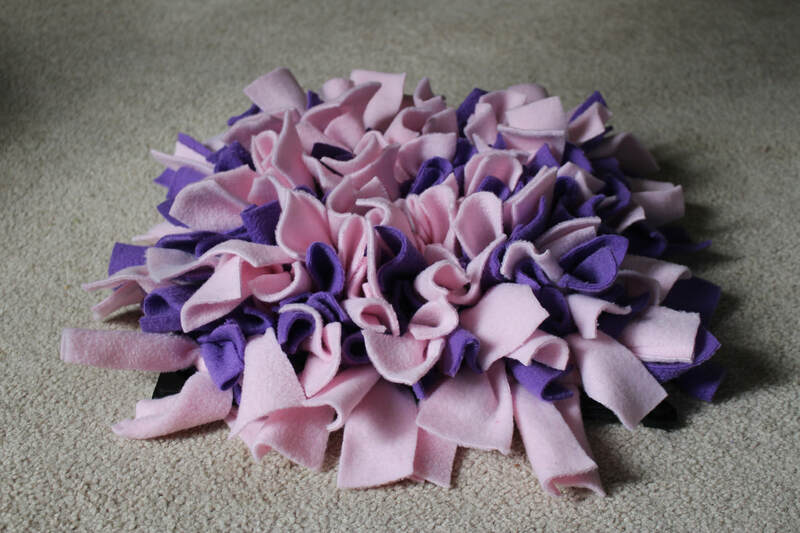 The video below shows how to make a snuffle mat. The rubber mat used in the video is approximately 12x12 inches. You can use any similar kind of mat, as long as it has plenty of holes to tie the fleece strips through. 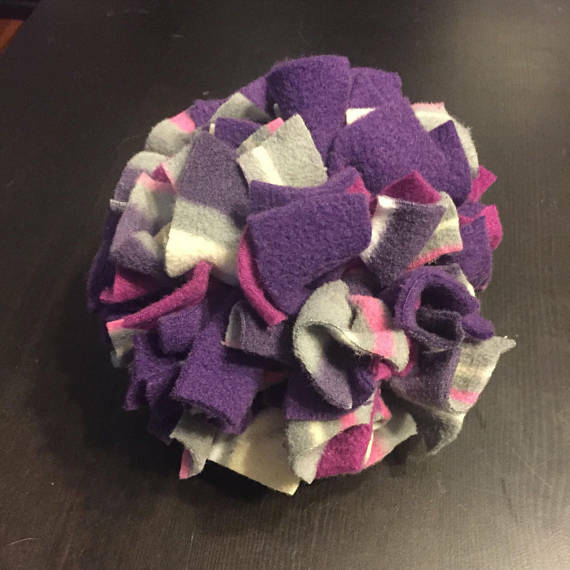 Fleece is the most commonly used material to make snuffle mats, but you can also reuse other materials like old cotton t-shirts. If you don't care too much about the colors, sometimes you can also find cheaper fleece in the discount bin at a fabric store. 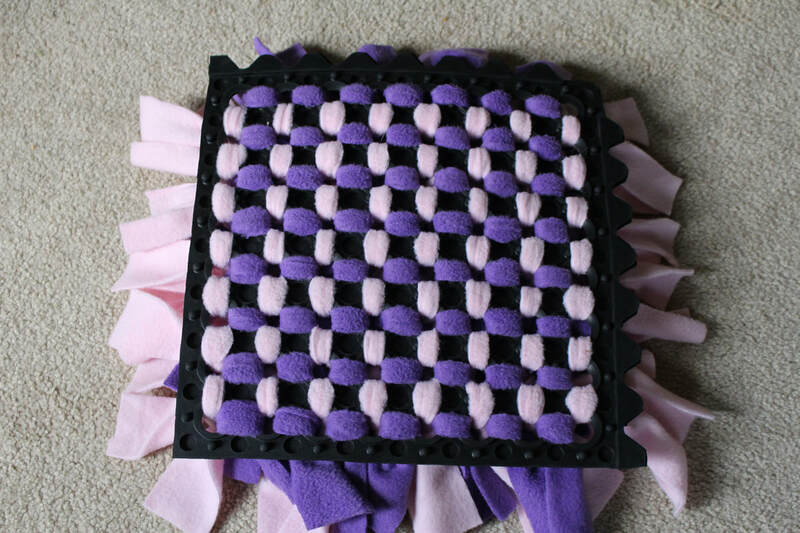 Snuffle mats are pretty easy to make, but it can be a bit time consuming to tie all those strips through the mat. To teach your dog to use the snuffle mat, simply spread some dry treats or kibble throughout the mat. Start out with several pieces of food sprinkled on the top of the mat. Once they get better at finding the food, you can make the game more challenging by hiding fewer treats and burying the food deeper in the mat. Puzzle toys have many benefits for dogs. They are mentally enriching, physically engaging, and lots of fun for dogs of all ages. 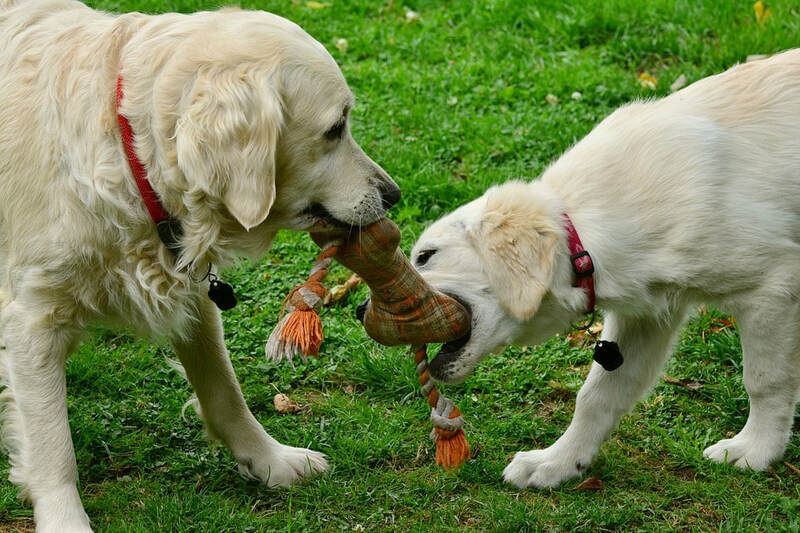 Puzzle toys also teach dogs to work for their food, use their nose, and problem solve. Some people feed their dogs their daily kibble using exclusively puzzle toys, which provides much more mental stimulation than using a bowl alone. Puzzle toys also prevent dogs from gobbling their food too fast, and leave them happier and more relaxed when they are finished. 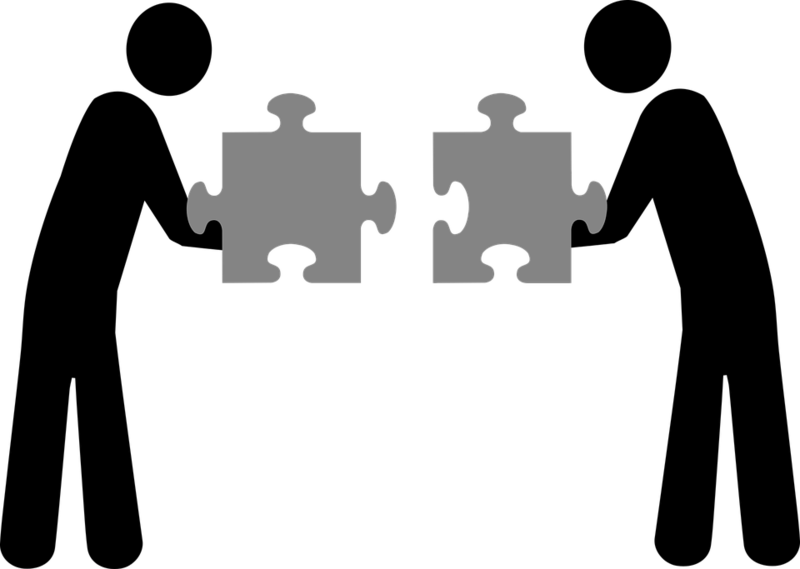 The puzzle games below are categorized into three sections; easy, intermediate, and challenging. The first category is suitable for dogs that may be unsure or new to puzzle toys, as they work great for building a dog's confidence and teaching them that it's fun and rewarding to work for their food. The following categories are best for dogs that catch on to new things quickly and enjoy working and figuring things out. Regardless of the game, it is always a good idea to supervise your dog with any kind of puzzle toy. Many of these toys have small pieces and don't hold up very well to chewing! The toys in this category, often labelled as "level 1 puzzle toys" are ideal for dogs that are inexperienced with puzzle toys, or those that tend to lose interest quickly. These games are intended to hold your dog's interest and teach them to enjoy navigating the world of puzzle toys. 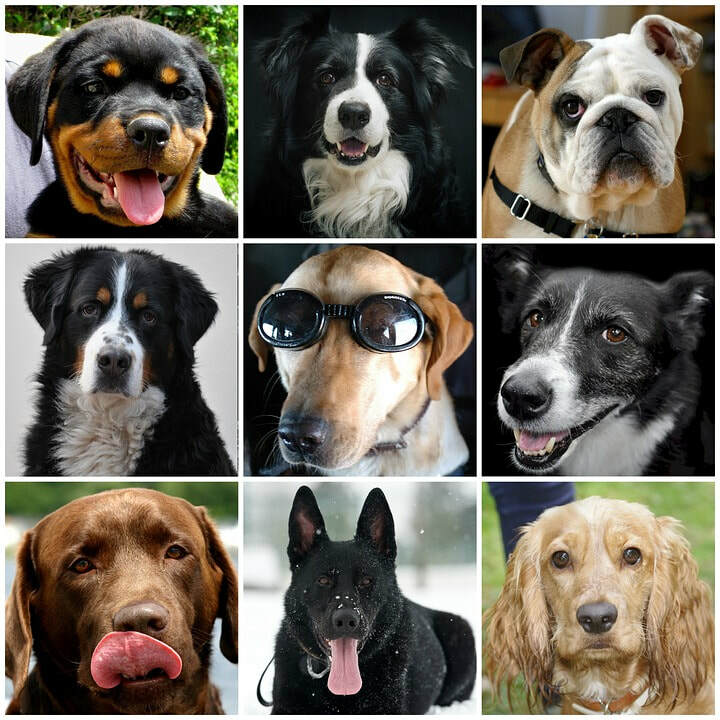 Once your dog has gained some confidence, you can try out level 2 or even level 3 puzzle games. The Gambling Tower is a brightly colored puzzle toy with a couple different features for dogs to figure out. You can place treats on the blue plates inside the tower, which can be released by the dog by tugging the black loops on the outside of the tower. You can also hide treats under the three green cones at the base of the tower. To uncover these treats, the dog needs to use their mouth to lift the cones straight up, as they can't be knocked over simply by a swat with their paw. This cute paw shaped toy by iMichelle is a fairly simple, but fun toy to introduce your dog to puzzle toys. This toy has seven yellow cups that you can hide treats under. To find the treats, your dog has to sniff out, and pick up or knock over the cups to reveal the food. You can stuff kongs with any kind of food you'd like, and even freeze them first if your dog needs more of a challenge. Kong also sells treat paste recipes in bottles for easy kong stuffing. These are available in a variety of flavors such as cheese & bacon, liver, pepperoni, and peanut butter. 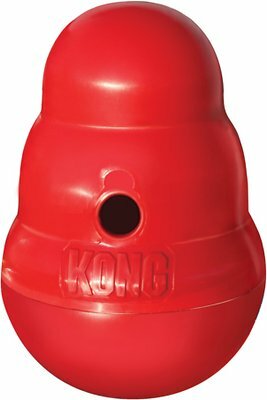 Kongs are not your typical puzzle toys, but they are great for occupying a dog and teaching them to work at something in order to get the food out. 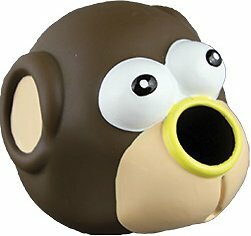 Stuffed kongs are fun and engaging for most dogs and they work well for tiring them out mentally as well as physically. 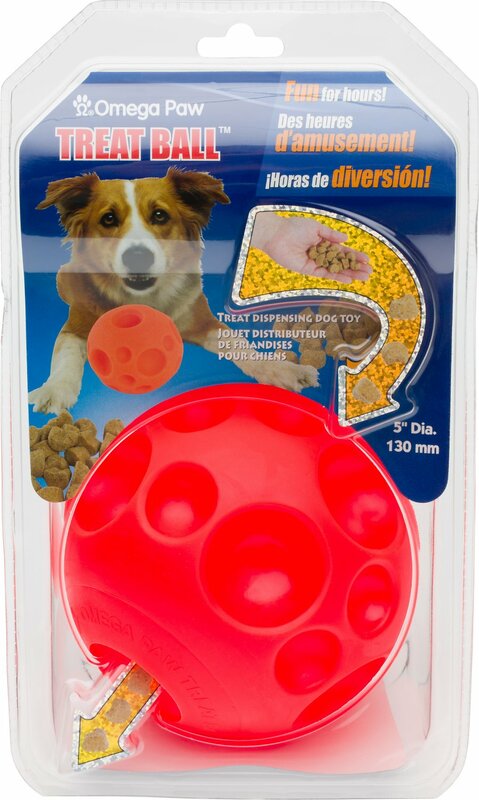 Food dispensing balls for dogs are quite popular and can be found in a range of sizes and styles. 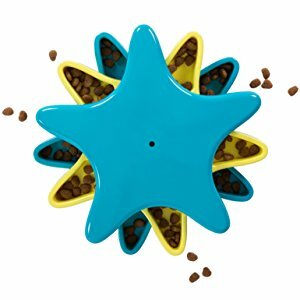 These balls typically have one or more holes somewhere on the ball, and food drops out from the holes as the dog rolls the ball around on the floor. These balls are great enrichment for dogs, and lots of fun once they figure out the main concept of the game. Omega Paw treat balls (left) are a popular choice, but you can find all kinds of different treat balls designed for dogs. The muffin tin game is an easy game for most dogs. 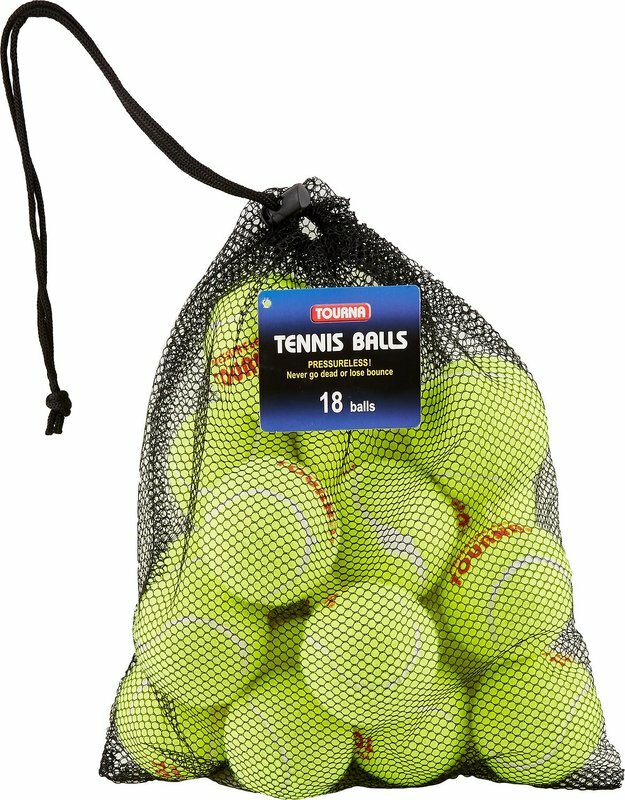 All you need for this is a muffin tin and half a dozen tennis balls. Put treats in 6 of the holes and place a tennis ball over each one. The dog has to pick up or nudge the tennis balls out of the holes to get at the treats. 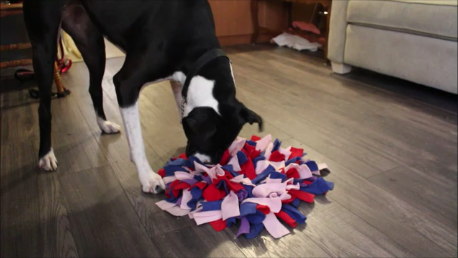 Snuffle mats are a fun way to feed your dog and teach them to use their nose. Snuffle mats consist of rubber or plastic mats for the base (with holes throughout the mat) and hundreds of fleece strips tied through the mat. You can hide all kinds of dry treats inside the fleece and then give the mat to your dog to sniff through and find them all. You can make the game easier by spreading several treats loosely on top of the mat, or harder by using longer strips of fleece and pushing the treats further into the mat. You can make these mats yourself with a rubber mat, a bunch of fleece, and a few free hours, or buy one from Etsy or Amazon. Slow feeding bowls are a good alternative to using a regular food bowl at feeding times. 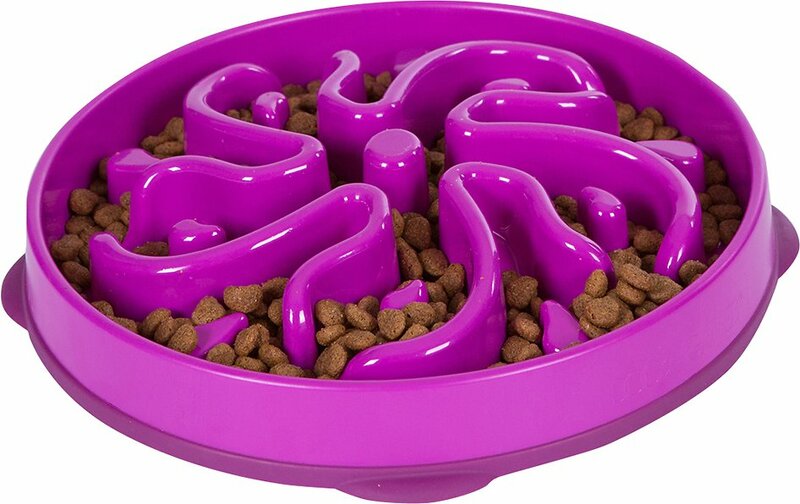 These bowls come in a variety of colors and styles, and work great for turning a handful of kibble into a fun game. Hol-ee Roller dog ball toy and some strips of fleece, or purchase a finished snuffle ball on Etsy. 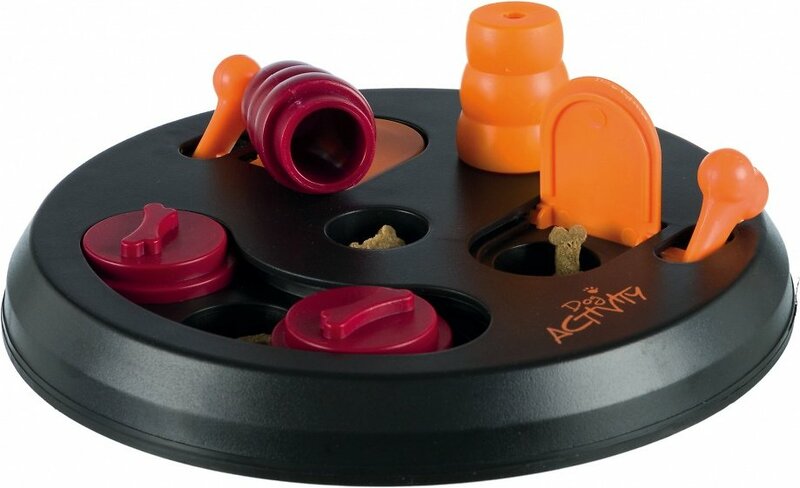 This shuffle style puzzle toy requires the dog to use their nose or paw to push the circles back and forth to reveal food hidden in the little chambers below. This toy has ten total slots for hiding food, and 6 discs for the dog to slide back and forth. This colorful SunGrow puzzle toy has a variety of different sliders to push around and reveal treats. It has four smaller sliding discs with eight small treat compartments at the top, and one larger clock style section in the middle. 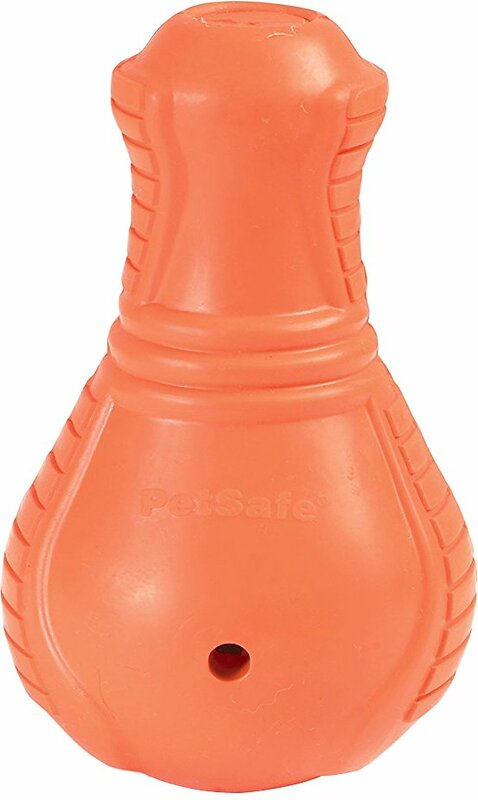 This toy is great for puppies and adult dogs alike, and you can make the game a bit easier or harder by hiding more or less treats inside. The Dog Tornado puzzle toy is a colorful toy that spins around to reveal treats in several different spots. Dogs can spin it around with their nose or paws, and you can also set the white plastic bones in the holes over the treats to make it more challenging for your dog. The Flip 'N Slide puzzle toy by Ethical Pets is a simple, eye catching game with a couple slightly different features. In the middle are three yellow discs that can be slid to one side to access the treats hidden underneath. The red covers can be flipped up with a paw or nose nudge to reveal three more hiding spots. The Pickpocket foraging toy is a mat made from fleece, with several little pockets to hide treats inside. 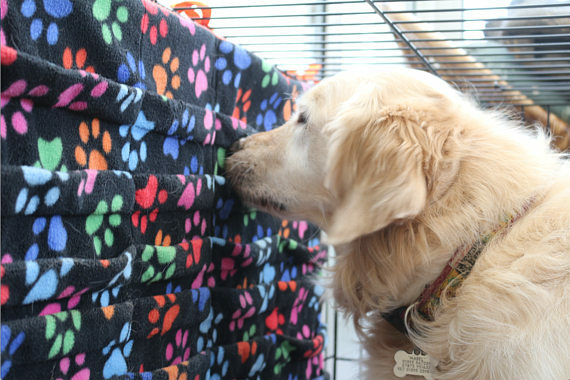 You can hang the mat up on the side of your dog's crate or simply leave it flat on the floor for your dog to sniff out the treats. Pickpockets encourage dogs to use their nose and they provide great mental stimulation for any kind of dog. 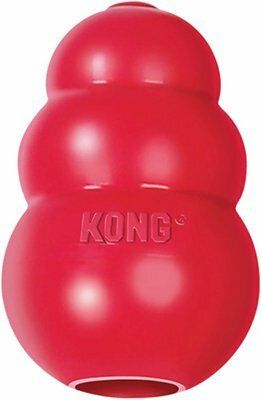 The Kong Wobbler toy resembles a giant red kong, but rather than chewing, wobblers are intended to stay on the ground and wobble back and forth when the dog pushes it. Pushing the toy makes it move around and drop treats periodically from the hole on the side. The StarMark Bob-A-Lot toy (right) is another similar alternative to the Kong wobbler toy. Both work in a similar fashion and are popular choices for any dog. The Lucky Dog Slots toy is pretty simple, but it's good for introducing your dog to interactive toys or using as a type of slow feeder. To activate the feeder and drop some food down, the dog has to push the blue platform at the bottom with their nose or paw. Food will drop down randomly from the sections above when the platform is pressed. These two in one slow feeders are a bit of a cross between a simple puzzle toy and a slow feeder maze. 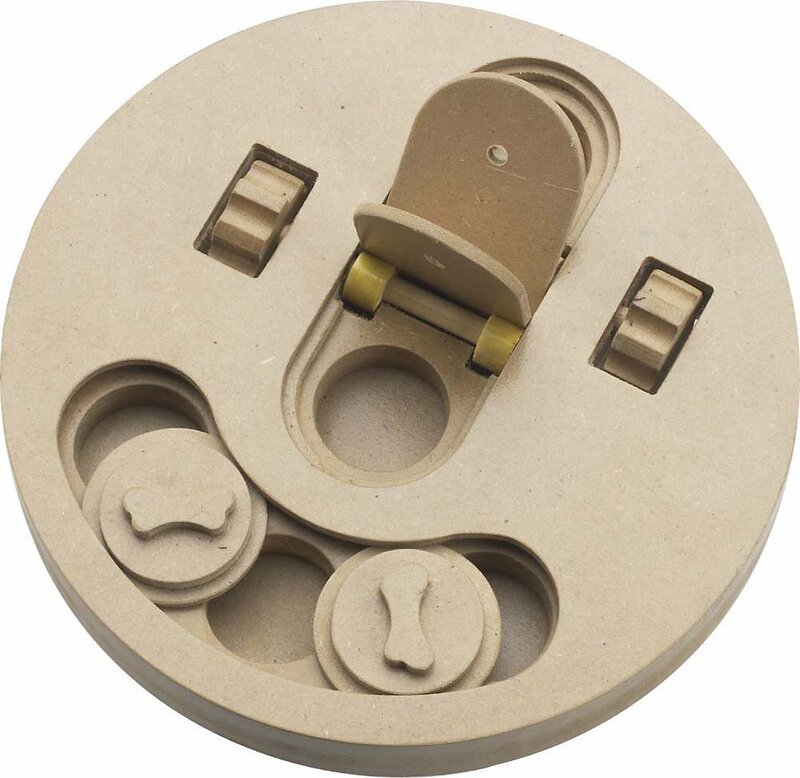 They have the typical ridges and maze pattern of a slow feeder in the middle, with some yellow sliding discs and hidden treat chambers underneath. 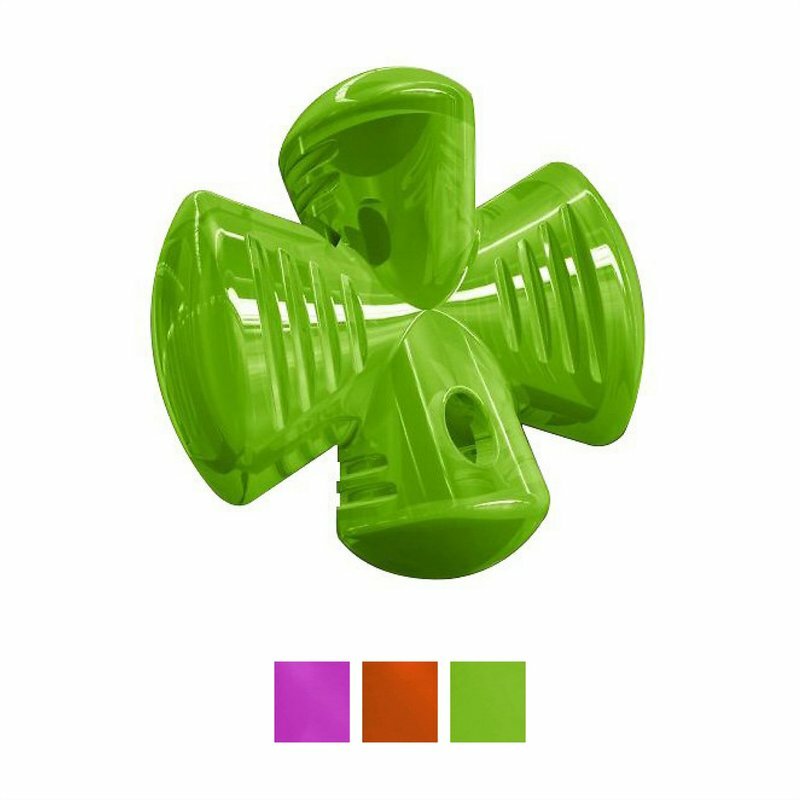 The Windmill puzzle toy by Trixie Pet Products is a colorful and unique looking dog toy. This game requires the dog to push the windmill or paw at it to release the food. You can start by leaving the cups open and put one treat in each one, and as the dog grasps the concept of the toy, snap the lids onto each cup to extend the game. The windmill toy comes with two sets of lids (with holes in the lid) so you can vary the difficulty level and keep your dog playing longer. This Dogit 3 in 1 puzzle toy includes three relatively simple games in one puzzle. For the first game, you can set the green knobs in each hole for the dog to pick up. For game two, you can place a stopper in the middle of the puzzle (included in package) so the knobs can slide around around the outside. It also comes with a big green disc that fits over the holes for the dog to push and slide around. This bone puzzle game is made by Nina Ottosson. This toy has nine white bones, with space to hide some treats under each one. To uncover the food, the dog has to remove the bones by nudging or knocking them out with their nose or paw. You can also attach strings through the holes in the top of each bone so your dog can pick them up in their mouth. 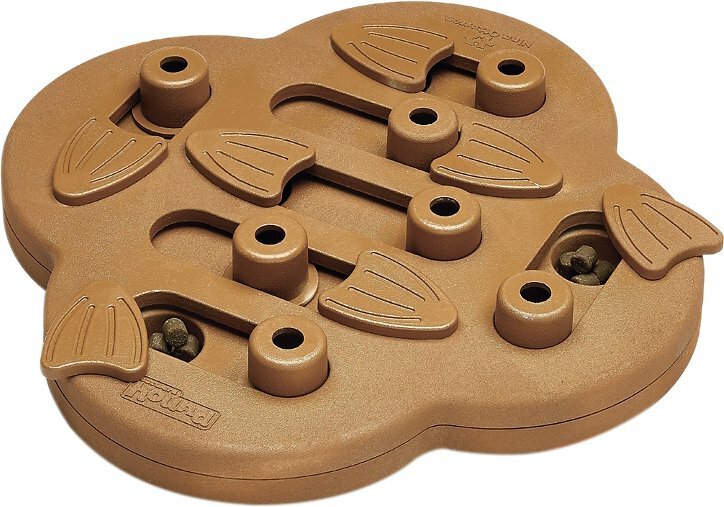 The Kibble Drop puzzle toy is made by Outward Hound. This toy works by dropping food into the hole in the middle of the toy. The food will randomly go into one of the four chambers, and the dog has to lift the flaps to open each chamber and look for the treat. You may want to use several pieces of food at first until your dog understands the concept, then switch to just dropping one or two pieces for the dog to search out and find. 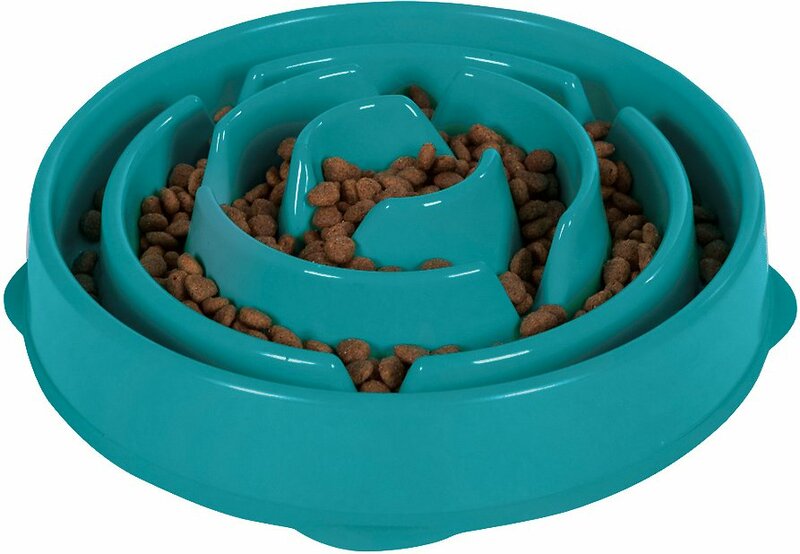 The Paw Flapper puzzle toy by Outward Hound has four green lids that can be flipped open, as well as eight food chambers inside the puzzle. 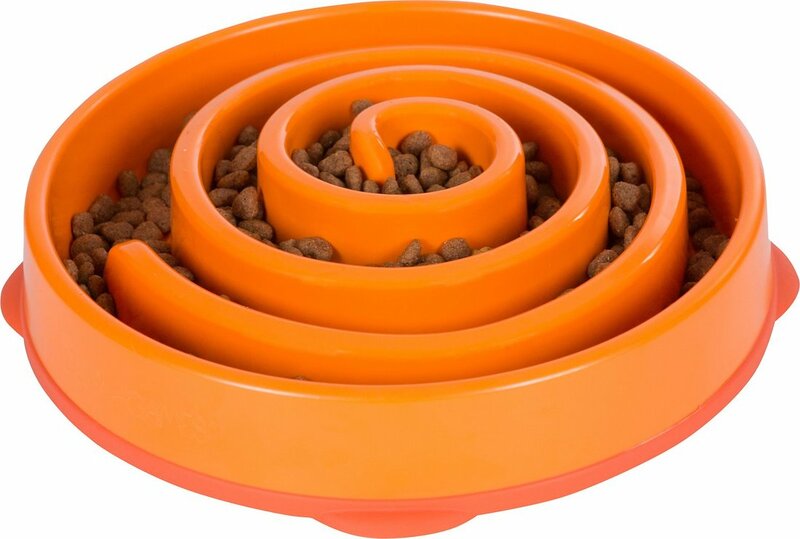 The dog can lift the lids up to find the food, and also push and rotate the orange part of the puzzle with their nose to find even more hidden treat chambers. The Tic Tac Twirl game is made by Outward Hound. This toy has larger compartments and could be used with a variety of different foods or treats. For this game, your dog has to learn to push the flaps in order to reach the food. They can also use the flaps to push the food out of the holes on the side of the toy. The Busy Buddy Magic Mushroom dog toy is another type of treat dispensing toy. The dog has to tip, flip over, or roll the toy around to get the food out piece by piece. This toy is great for mealtimes, or just to stick some kibble in to keep your dog occupied for a little while. 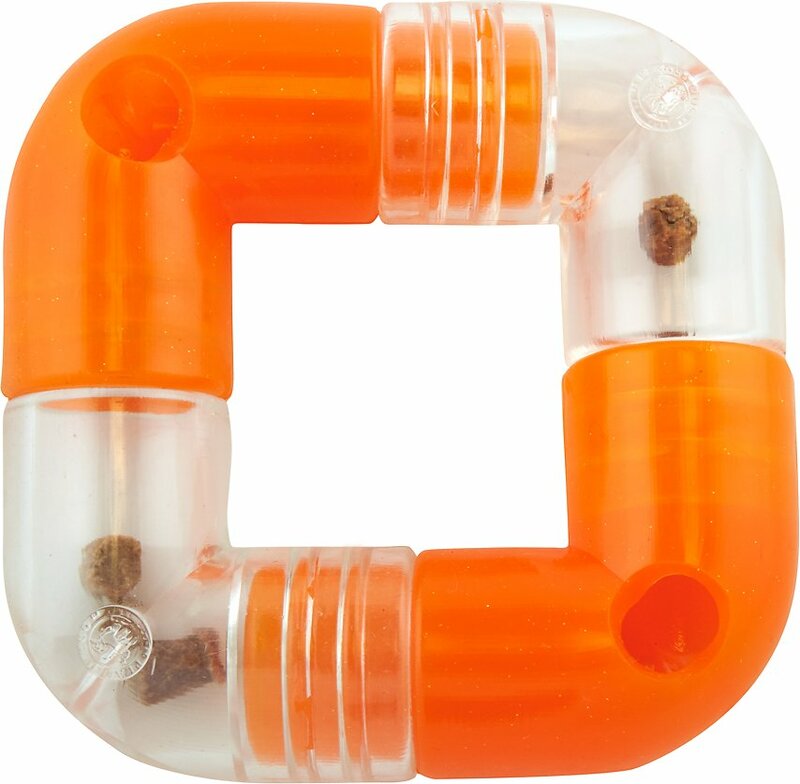 The Busy Buddy Barnacle toy is a 2 in 1 treat dispensing toy and rubber chew toy. 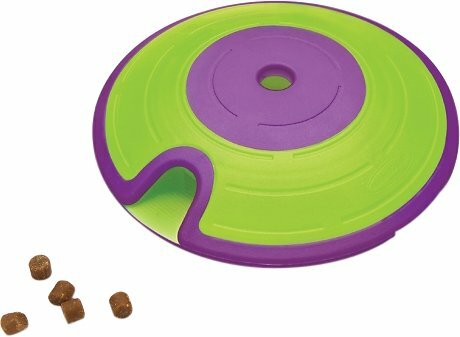 Treats can randomly drop out of one of three holes in the toy. The holes are all different sizes, which makes it easier to stuff treats of different types or sizes inside. Peanut butter can also be smeared onto the bone shaped grooves along the side of the toy. 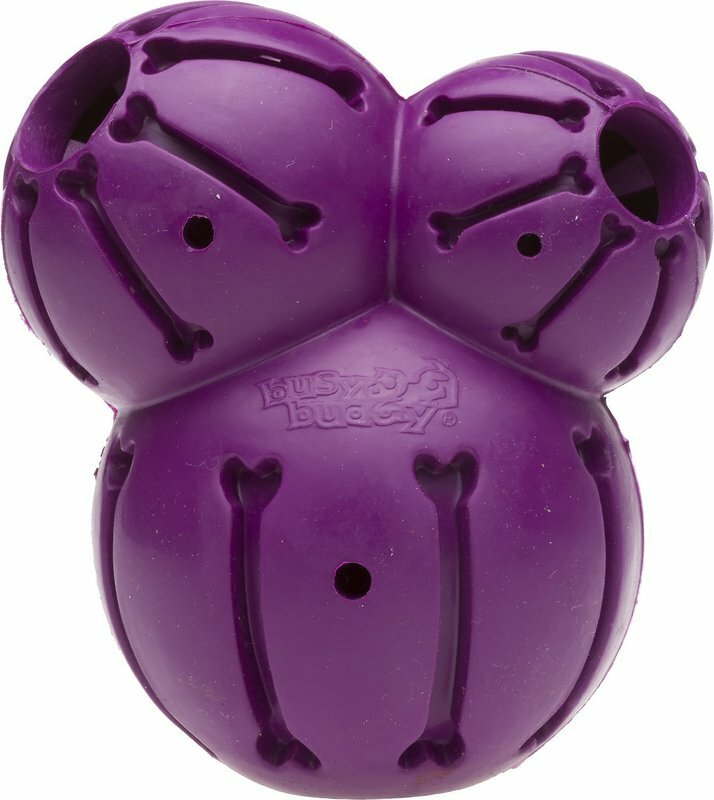 The Busy Buddy Waggle dog toy is another similar type of toy, with two holes for dispensing treats on each end of the toy. It also has grooves on the outside for smearing peanut butter if wanted. It also works well as a chew toy for chewers of average strength. The Squeak N Treat toy is another type of rubber toy for dogs to chew or toss around. This toy not only dispenses treats, but also squeaks when the dog squeezes it. 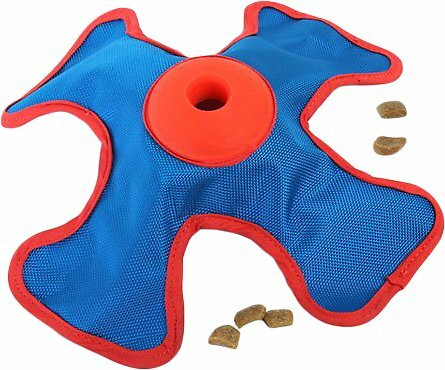 If it's used with food inside, the treats will fall out randomly as the dog plays with it. This toy is also dishwasher safe. 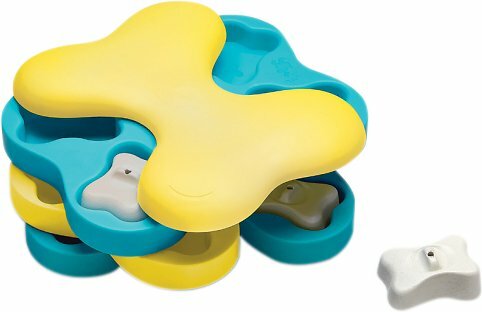 This Nina Ottosson puzzle toy is an entry level game for dogs new to puzzle toys. This toy has nine pegs, with a small space to hold treats under each peg. In order to reach the treats, the dog has to knock out each object. This puzzle is made from a wood composite material that has a wood look, but is more durable and made to last. This puzzle is great for shy or quiet dogs and makes a great confidence building puzzle toy. 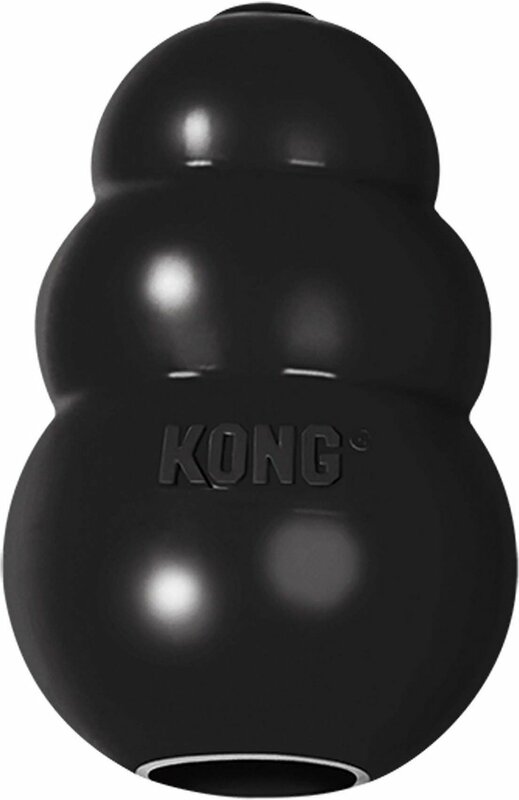 While the traditional kongs are most popular, the company has made a variety of similar toys to keep any dog busy and occupied. 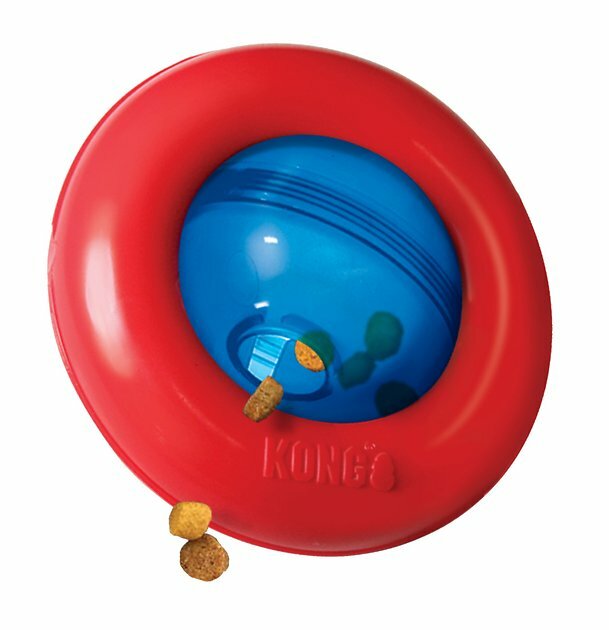 The Kong Stuff-A-Ball toy (left) is one of these toys. 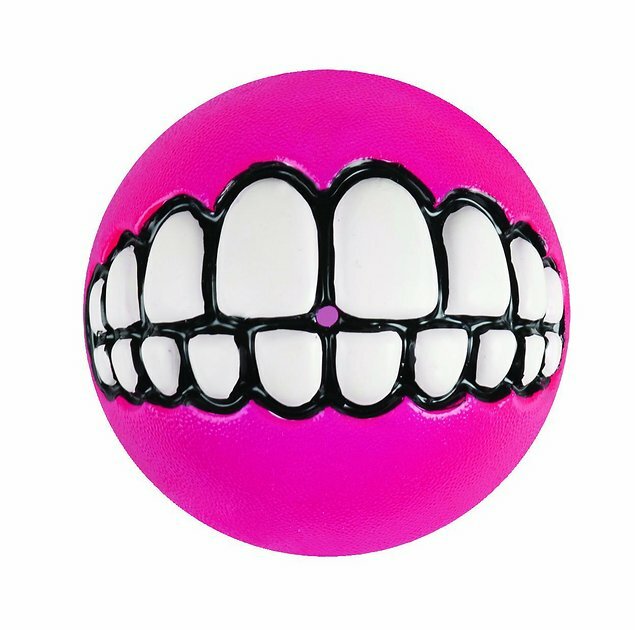 This ball has ridges along the outside, which helps clean teeth and massage gums. You can also put some peanut butter or squeezable treats into the ridges to entice your dog to chew more. You can also fill the middle with dog treats or wedge large biscuits inside to extend playtime further. Kong also sells a few more food puzzle toys, such as the funky looking Jump'N Jack, and the Goodie Bone chew toy below. Both of these can also be stuffed with food and work great for engaging your dog and keeping them occupied. The Star Spinner puzzle toy by Outward Hound is a colorful and fun beginner puzzle for new dogs. This toy is fun for dogs of all ages and sizes. The Star Spinner has ten treat compartments, and three sections that spin around. The dog has to find the treats by pushing the various parts of the star around. Once your dog gets the hang of it, you can make this game a little more challenging by only putting treats in a couple places so the dog has to use their nose and search a little harder. The Fun Feeder Mat is another type of slow feeder by Outward Hound. These mats come in three colors; green, teal, or pink. They work great for slowing a dog's mealtimes, as well as having a bit of fun while sniffing and hunting out their food in the ridges. These bowls have a bit of flex to them, so they work especially well for dogs with short snouts that may have trouble getting their noses into tight corners of other bowls or toys. The Discovery Wheel puzzle toy by Ethical Pet is a game wheel with pieces that slide back and forth around the wheel. 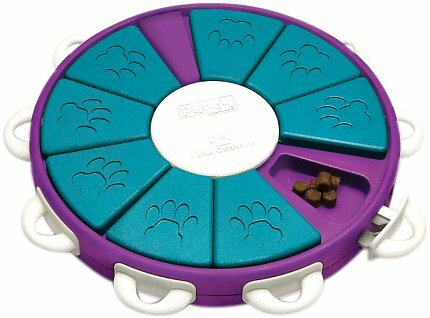 The game has several treat chambers around the wheel to hide your dog's kibble or favorite treats. Six bricks with decorative dog bones can be pushed and slid around the circle by your dog using their nose or paws. 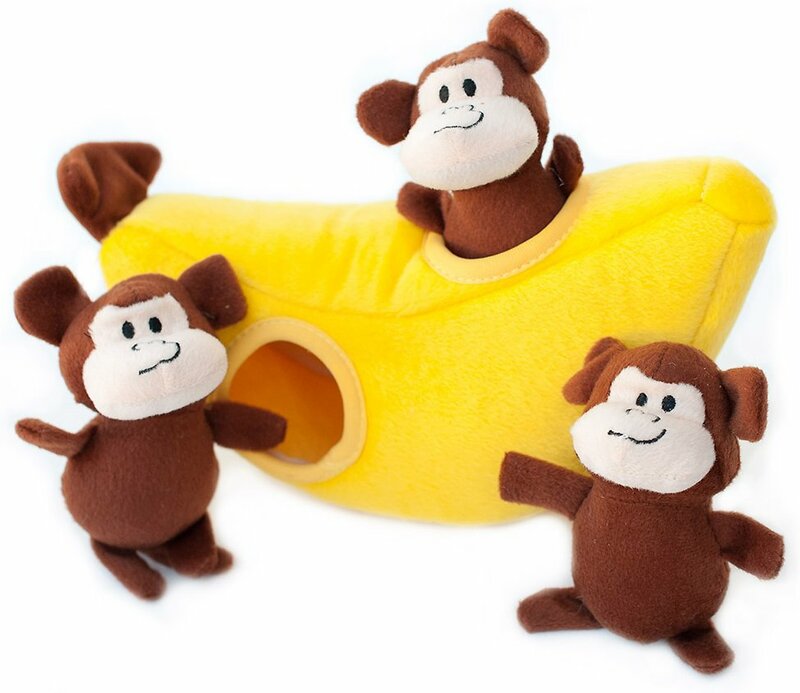 Like many other Kong brand toys, these are also designed to be stuffable. 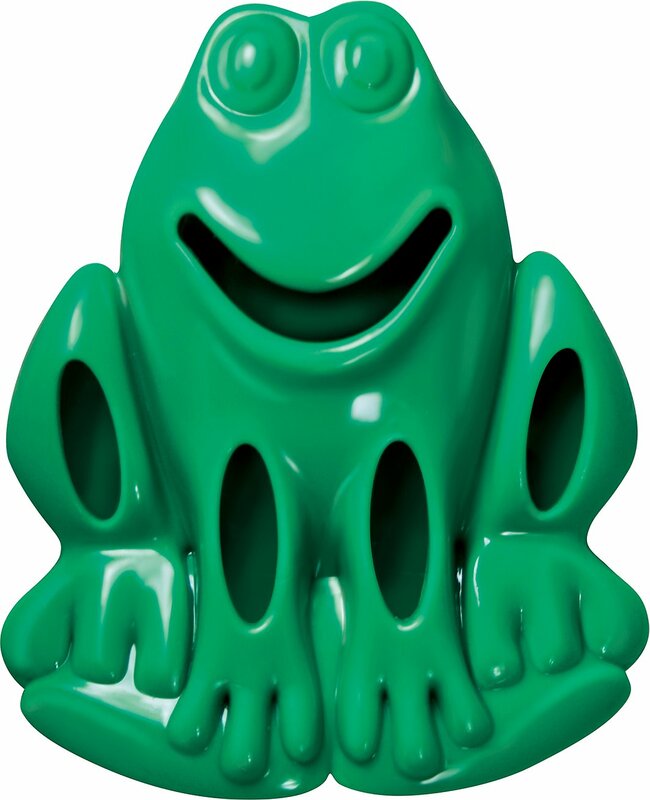 The Quest Bone toy, Wishbone, and Frog toy are all made of slightly more flexible material than other kong toys and are a bit more affordable. They're perfect for lighter chewers that enjoy food stuffed toys, but prefer something in a different shape than traditional kongs. 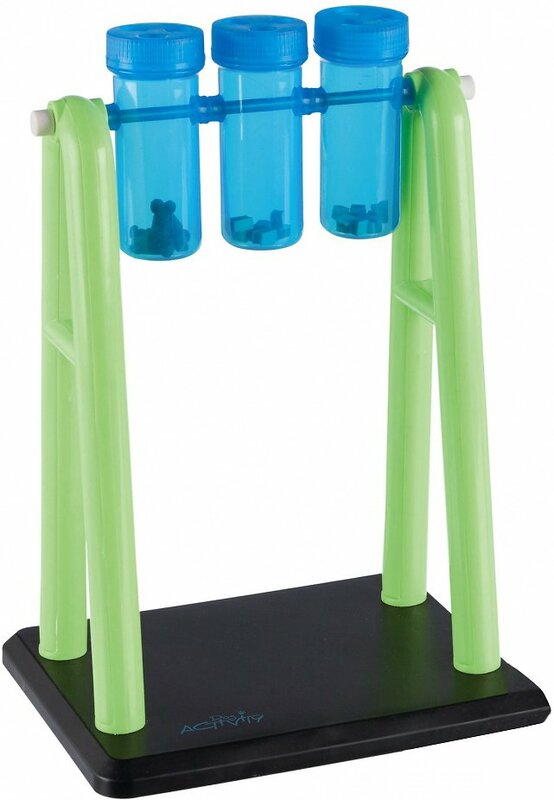 The Busy Buddy Twist 'n Treat toy is a unique treat dispensing roller ball. The difficulty can be easily adjusted by screwing the lid on looser (to leave a larger gap for the food to fall out) or twisting it on tighter for more of a challenge. This toy is also top rack dishwasher safe. 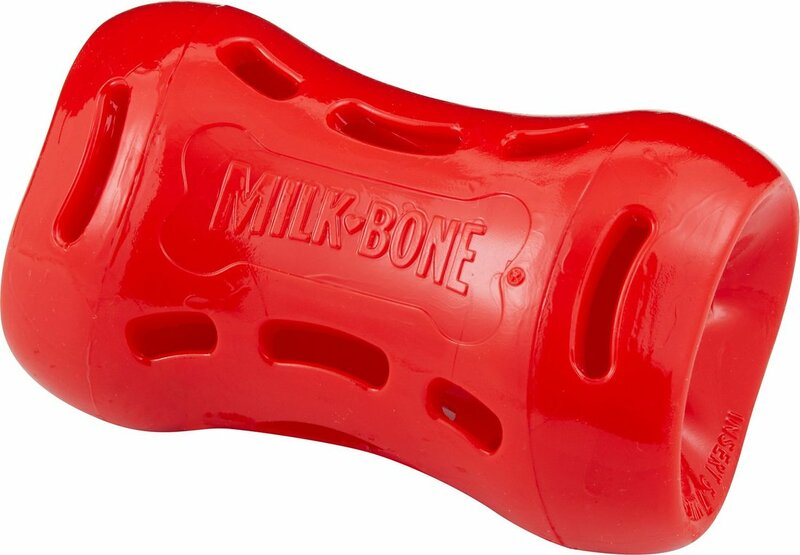 The Milk Bone Treat Tumbler is another type of treat dispensing toy. It can be rolled, tossed, or flipped over by your dog to retrieve the treats inside. The toy is compatible with milk bone mini biscuits, or other similar sized treats. 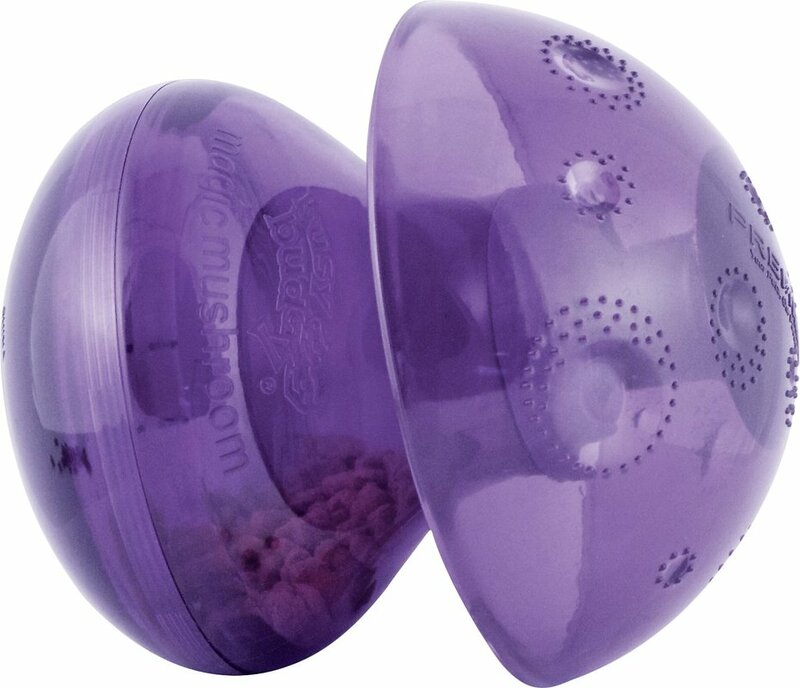 The Omega Paw Xtreme Treat Ball is a toy and treat dispenser in one. Great for fetch and tug of war, or your dog can carry it and toss it around to get the treats inside. Supervision with this toy is recommended if your dog is a tough chewer. 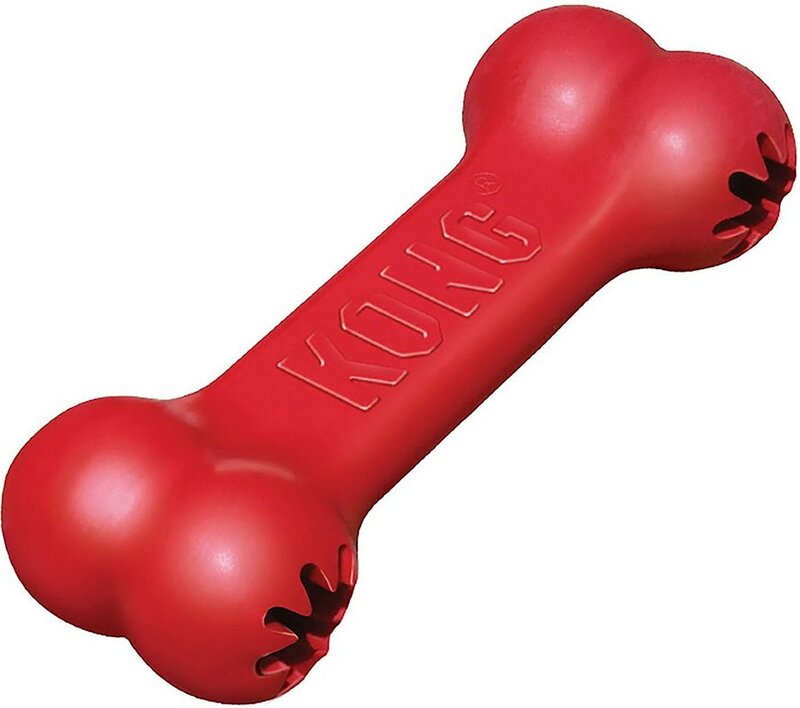 The Kong Gyro toy is a different type of treat filling toy by Kong. This one is more of a treat ball as opposed to a stuffable chew toy. 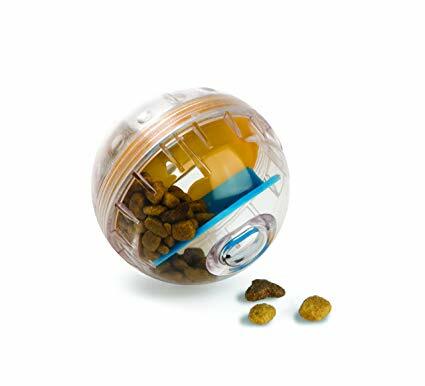 The gyro ball is filled with dry kibble or treats, encouraging the dog to roll and flip the ball to dump out some food pieces. The lip around the outside ups the challenge and makes it easier for the dog to carry the toy around. 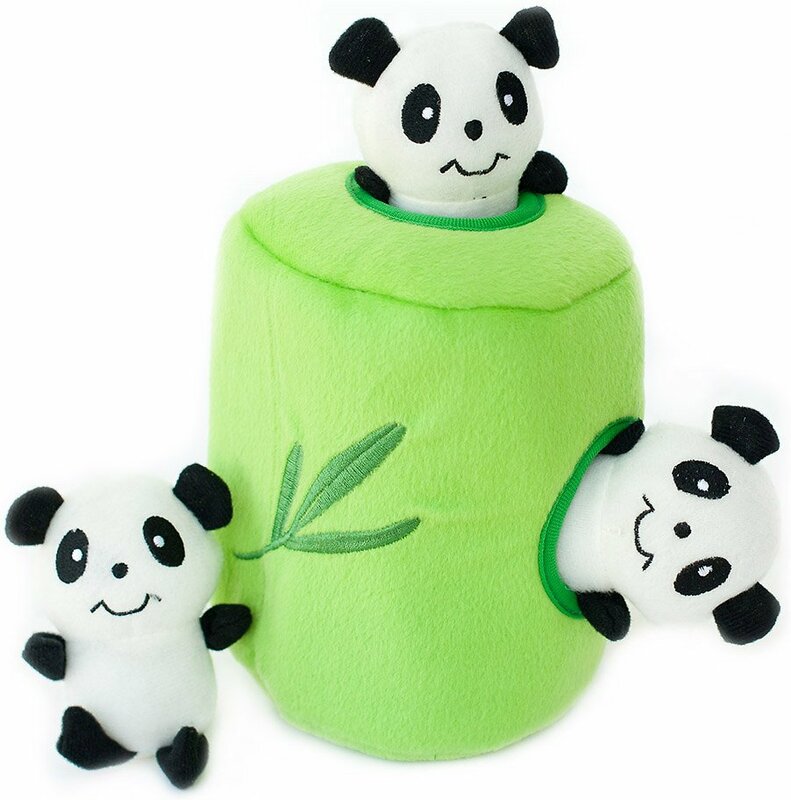 These little monkey and panda dispensers are super adorable, but they are lightweight and best used under supervision. The food drops out fairly easily from these, so they are best used as a replacement kibble bowl for your dog's daily meal times. These toys are so cute, but probably best suited to calmer or older dogs that need an easy and fun game to build their confidence and give them an interactive way to eat their dinner. 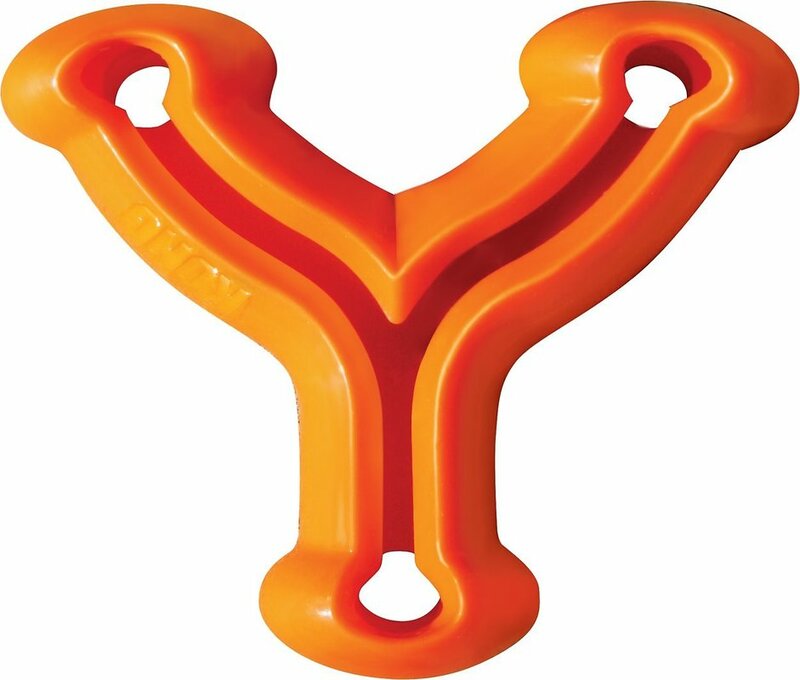 The Orbee-Tuff Link puzzle toy is a tube type toy with a couple holes in the corners for food to drop out. Dogs can get the food out by tossing or flipping the toy around. 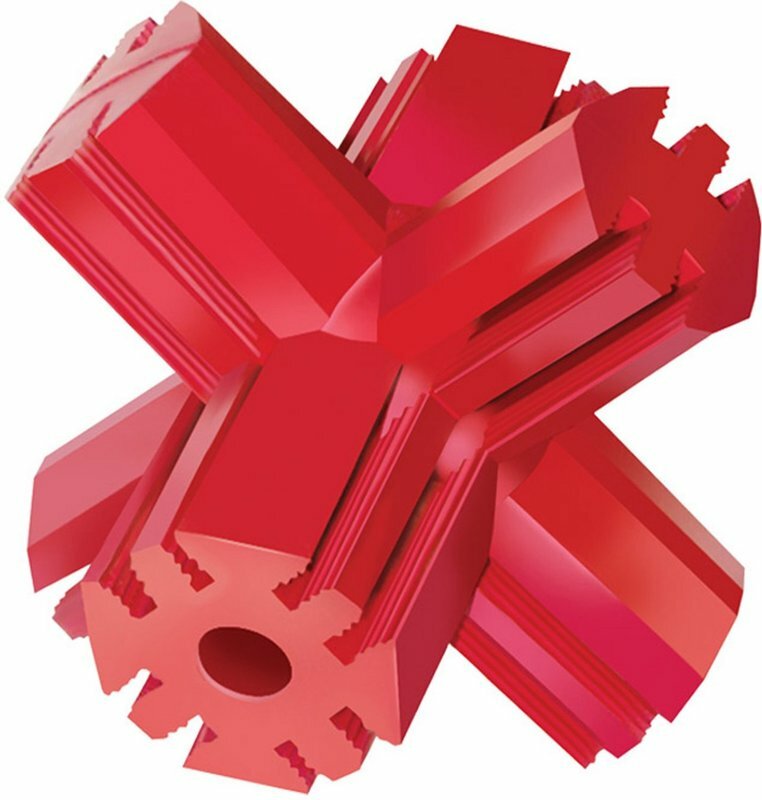 You can even purchase an additional toy and assemble it into different shapes for a unique and more challenging puzzle. The Bionic Stuffer dog toy is a treat dispenser and durable chew toy all in one. 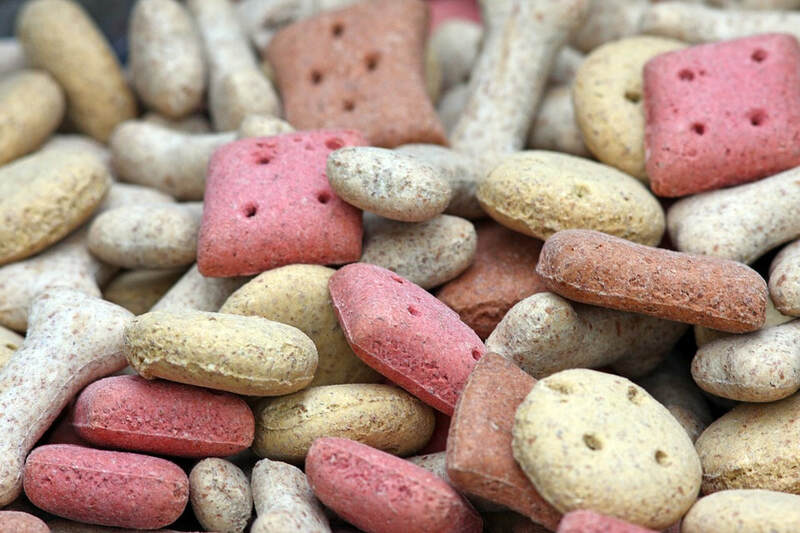 The tough rubber holds up to chewing, while the treats help keep your dog occupied and engaged. It even floats and bounces, so it can also be used for a game of fetch on land or in water. If your dog zips through the level 1 challenges and finds it more entertaining to chew the empty toy, or if they keep asking you for refills every thirty seconds, you may want to try something a little more challenging. 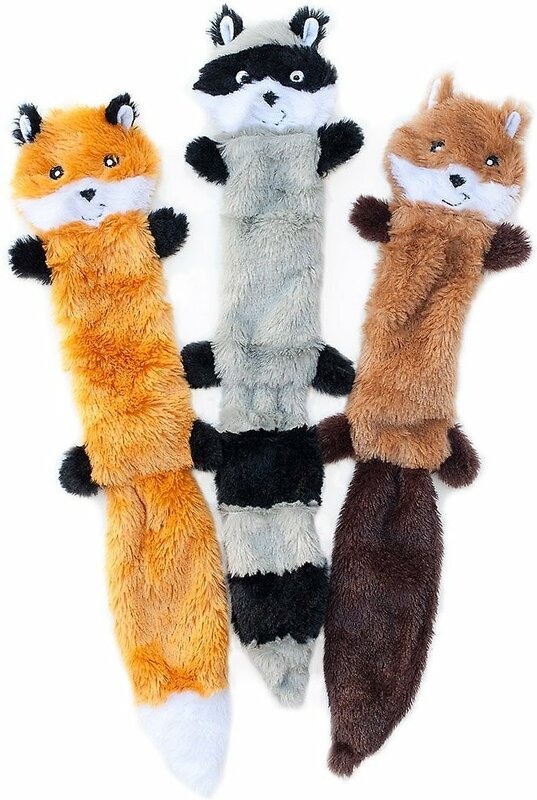 These toys might turn off a calmer, shy dog, or one who loses interest quickly, but they are perfectly suited to those dogs who prove they need something a bit harder in order to actually challenge them. All four boxes in the Poker Box toy need to be opened in a different way to reveal a treat. One has a knob to lift, whereas another needs to be opened sideways like a drawer. The third one opens at the press of a button, and the last needs to be lifted up by the rope handle. The Dog Brick puzzle toy has three different features, and several compartments to hide treats in. 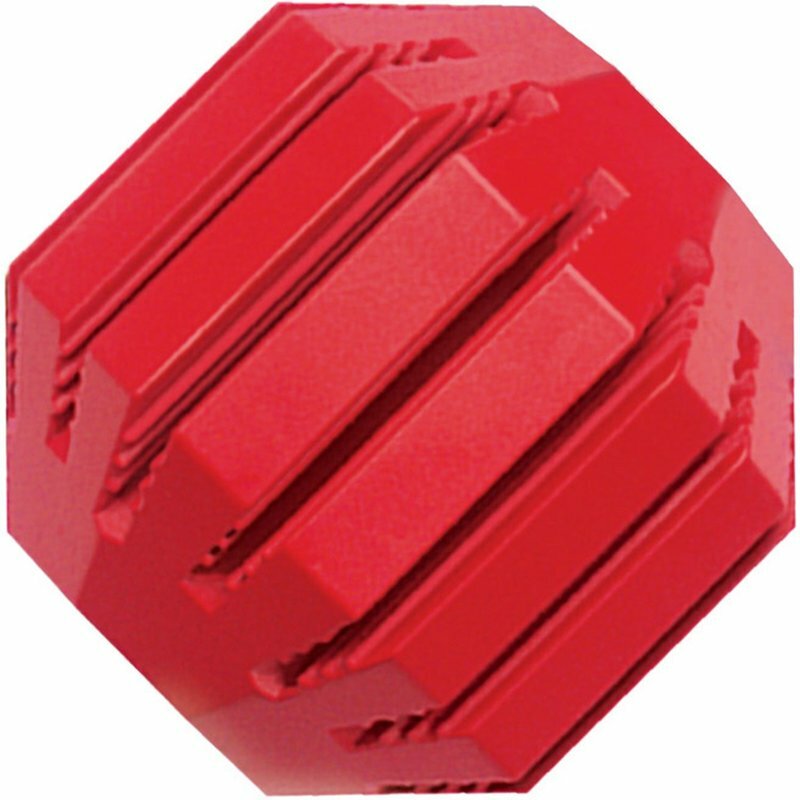 All eight red blocks slide back and forth to reveal eight treat chambers, and also have a lid on top that flips open to reveal eight more chambers. In addition, there are also four plastic white bones that can be placed in the middle. The Hide N' Slide puzzle toy has many moveable pieces that slide and swing in different directions. It has seven round sliders that can be moved back and forth, as well as seven flat discs that swing in and out. This toy is great even for short nosed dogs, as the game pieces are all elevated above the game board. It also has no removable parts, all the pieces shift around, remaining intact on the puzzle. The Treat Maze puzzle toy by Nina Ottosson is super easy to load with treats and keep your dog occupied for awhile. Dogs love to push this around with their nose or paws and try to figure out how to make the treats drop out. This colorful saucer is simple and easy to keep track of with no extra small pieces, and lots of fun for any dog with an enthusiasm for puzzle toys. This K9 Pursuits puzzle toy has a couple different challenges for your dog to tackle. First of all, it has three sliding discs with bone indents on them. Sliding these discs around the circle reveals a few holes to hide treats in. The section in the middle also has a knob that the dog can lift to find another chamber. The K9 Pursuits Marple toy is slightly more challenging than the one above, with pieces that flip out and turn. The two oval shapes on each side swing outwards to reveal a couple hiding places for food, while the large bone in the center also turns either way, with two treat chambers hidden underneath. The Game Bone puzzle toy by Trixie Pet Products has two main features. There are a couple round sliding discs that dogs can nudge back and forth with their nose, and some pegs to pick up in their mouth and take out. You can also put the pegs in between the sliders to use as stoppers and make the puzzle a bit more challenging. The Mad Scientist game by Trixie Pet Products is a fun game where dogs have to paw at the beakers to tilt them upside down and release the treats. After your dog has mastered the basics of flipping the beakers, you can add patterned lids (included with the game) to extend play time and increase the challenge. The Pupper Pamper Interactive dog toy is a bit bigger, and is another similar alternative for this type of puzzle toy. 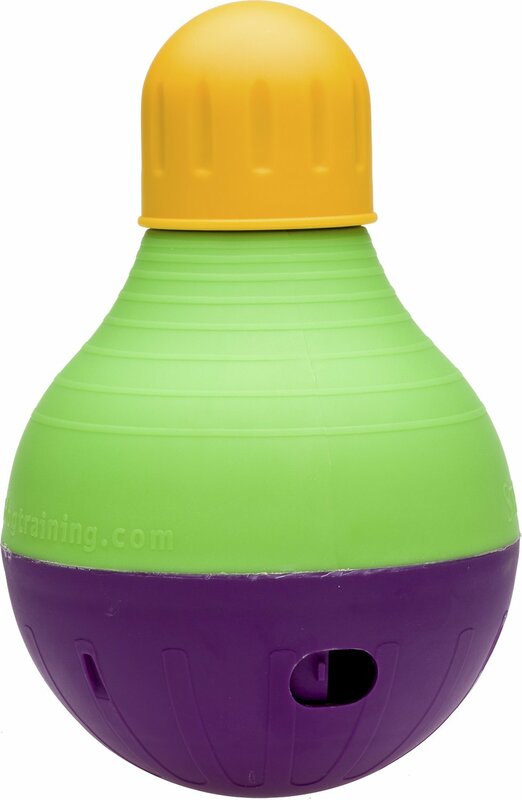 The Tug-A-Jug toy is a creative treat dispensing puzzle and fun play toy in one. It has a textured rubber ball, as well as a rope toy for play, and will periodically drop treats to keep your dog's interest. It is not designed for extensive chewing however, so supervision is still advised for this toy. 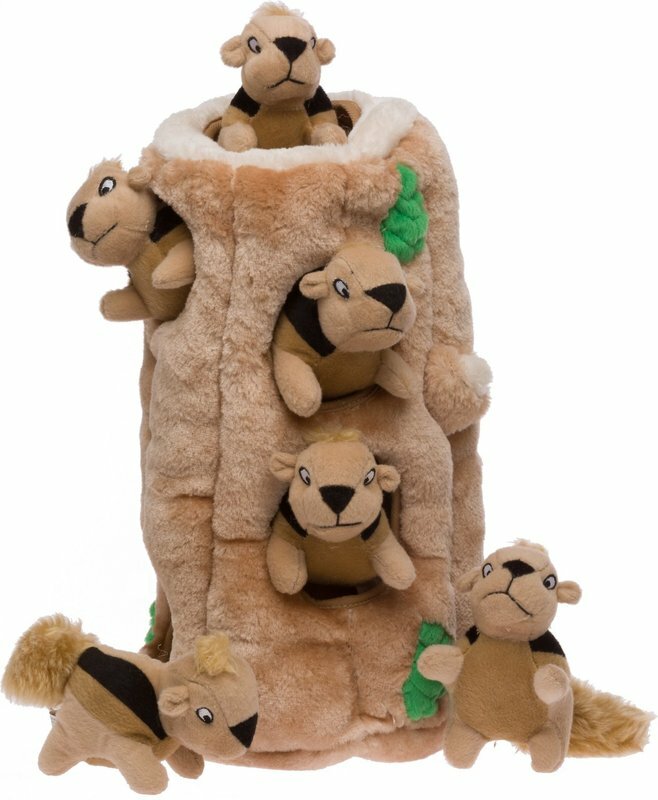 It has a pretty large capacity for holding kibble, and keeps dogs occupied and active for a fairly long time. The Treat Wheel puzzle toy is made by Outward Hound. 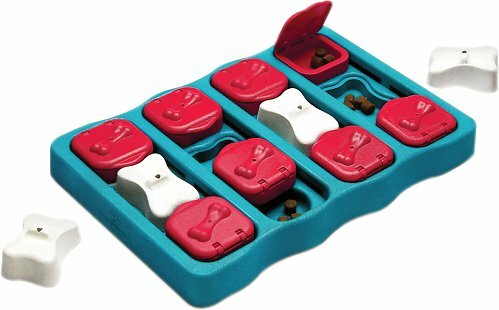 This game has 4 removable cups, and eight treat chambers altogether. Four of them can be found under each cup, and the dog can find four more hiding places for treats by pushing the blue lid around in a circle after they remove the four orange cups. The Flip 'N Flap puzzle game is made by Ethical Pet. This toy has five little holes to hide your dog's treats in, and a couple different puzzles for your dog to figure out how to get them. The toy has a couple sliders at the bottom for the dog to push back and forth with their nose and also has a couple unique compartments with flaps. The flaps can be opened by pawing at the dials on each side. The Triple Treater Totter toy is a puzzle game made by Outward Hound. 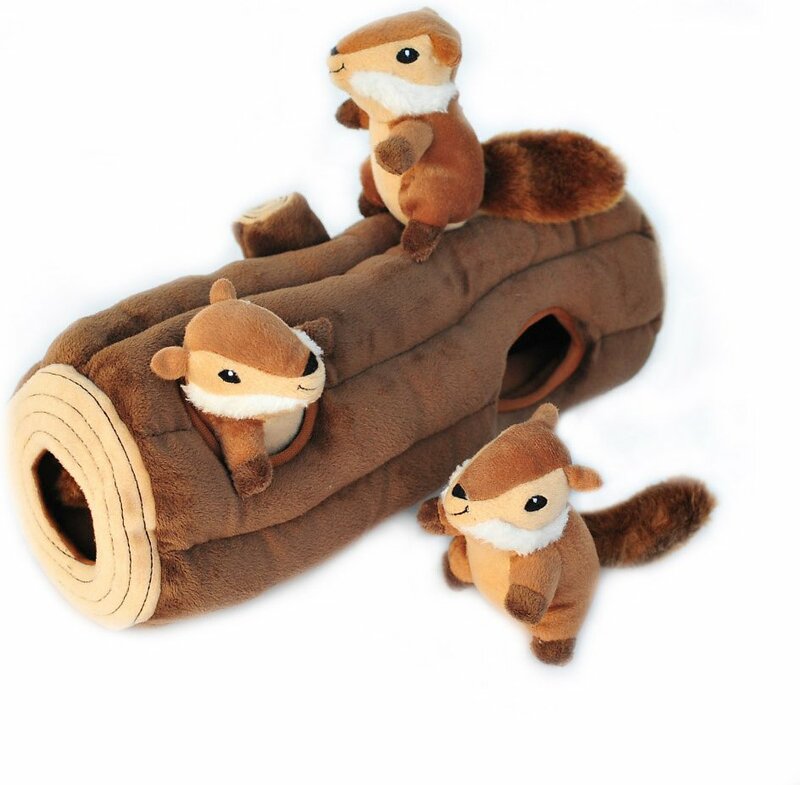 This toy has a teeter totter motion, which drops treats into any of the three treat basins. Treats can be refilled into the compartment in the center of the toy. Nudging or pressing on the toy triggers the treats to come out. If your dog really needs a challenge, or you suspect they will breeze through some of the puzzles above, the games in the level 3 list might be perfect for them. Many of these toys can also be made easier at first by removing certain pieces, and then increasing the difficulty later on when your dog catches on to the game. The chess game puzzle toy is a game that you can start simply and gradually move up to the more challenging parts as your dog learns. It has cones that need to be lifted straight up, sliders to move back and forth, and more sliders that move in the opposite direction. You can also put the cones in between the sliders so the dog has to remove those first before moving the sliders. The Mover Puzzle Toy by Trixie Pet Products is another level 3 puzzle toy with a few different puzzle components. 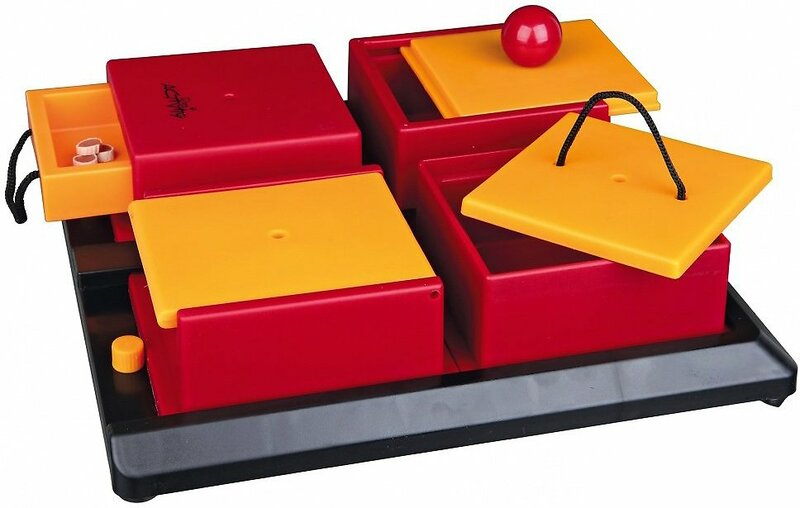 This game has cones that lift up, sliders that move back and forth, and two drawers on the sides. One drawer opens by pushing a knob, and the other by pulling on the attached rope loop. The Move-2-Win puzzle toy has a few more drawers, along with other features that the previous level 3 puzzle games have had. The two cones on either side can be lifted straight up to reveal two treat chambers, and the two red drawers can be opened by tugging gently on the black loops attached to them. The yellow drawers are opened by pushing a knob. 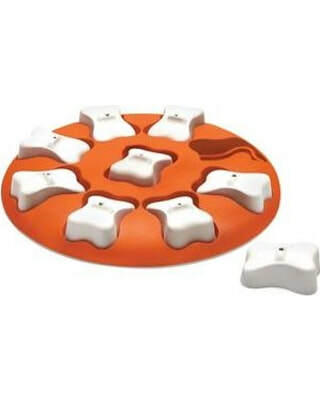 The Dog Casino toy by Nina Ottosson has several orange drawers that dogs can pull open from the sides. If your dog proves that too easy, you can also lock the drawers by turning the white bones on the top of the puzzle, so the dog has to learn to paw at the bones before opening the drawers. 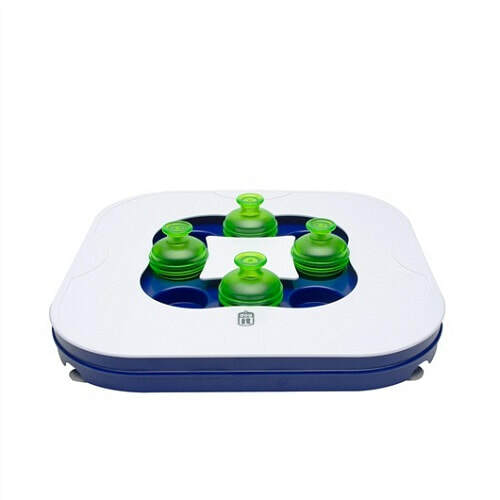 The Dog Twister puzzle toy is a game with blue sliding panels on the top. When the dog pushes the panels around, the treats are hidden underneath. 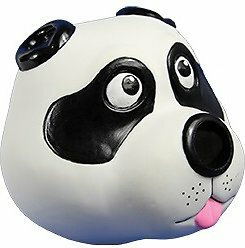 Once your dog learns to breeze through that aspect of the game, you can increase the difficulty by pushing in the white handles on the sides of the toy. Pushing in the white handles will lock the blue panels in place, requiring the dog to pull the handles out before they can slide the panels and access the treats. 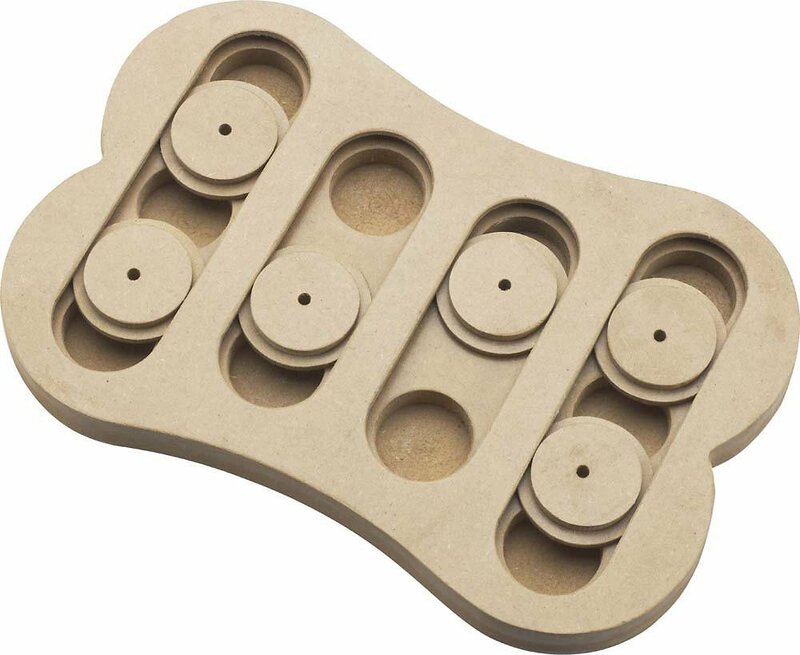 The Dog Worker puzzle toy by Nina Ottosson is a wood composite material (looks like wood but easier to clean.) This toy has little "wings" that swing back and forth, as well as some round sliders for dogs to push with their nose. In addition, the large round disc in the middle can be spun around in a circle to reveal six more potential hiding places for treats. Puzzle toys are a great choice of enrichment for all kinds of dogs, particularly for active and high energy breeds like border collies, australian shepherds, cattle dogs, german shepherds and more. As you can see, there are countless ways to make the most of your dog's daily meals by combining eating with mental stimulation and physical exercise. The options for puzzle toys are endless! Thanks for reading, and I hope you found an idea or two to take away for your own active pup. :) You can also check out the Dog Enrichment Ideas page for even more fun games and interactive activities. 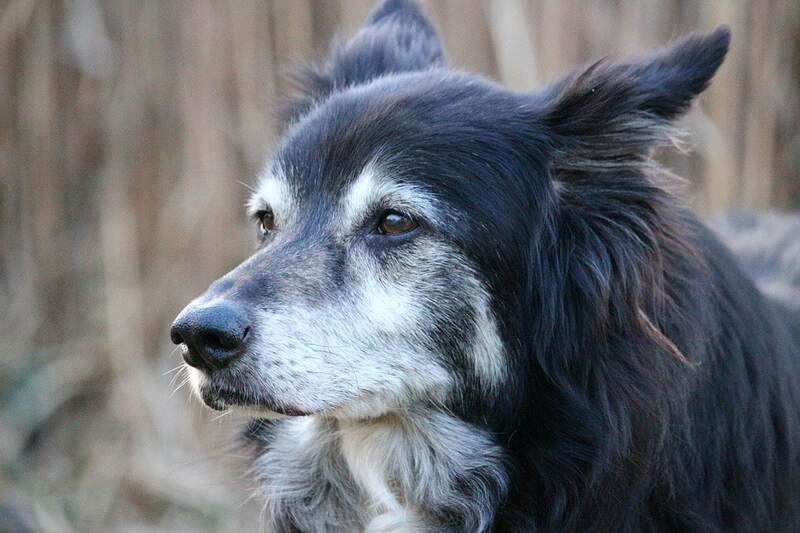 Chaser, a border collie who has learned over 1000 words, is often dubbed as "the world's smartest dog." Chaser has the largest vocabulary of any non human animal. She has been taught to find and retrieve hundreds of different toys by name, even from a giant pile of toys. She can also learn to retrieve a brand new toy from a pile just by hearing the new name and associating it with the new item. Her owner John Pilley is a retired psychology professor who has been teaching Chaser new words since 2004, when she was just a puppy. Together they have appeared on countless television broadcasts, on the news, radio, and in countless articles across the internet. After learning countless individual words, Chaser also began to learn short sequences with nouns and verbs. She can take one toy to the porch and bring another back to her owner, as well as pair several other commands with nouns she already knows. John Pilley has been recording his research findings about Chaser and even wrote a book about Chaser and their training experiences together. Everything Chaser has learned has been through praise and play, especially with her favorite toy, a little blue raquet ball. Although Chaser has been Pilley's research partner since she was 2 months old, she is first and foremost a beloved member of the family. 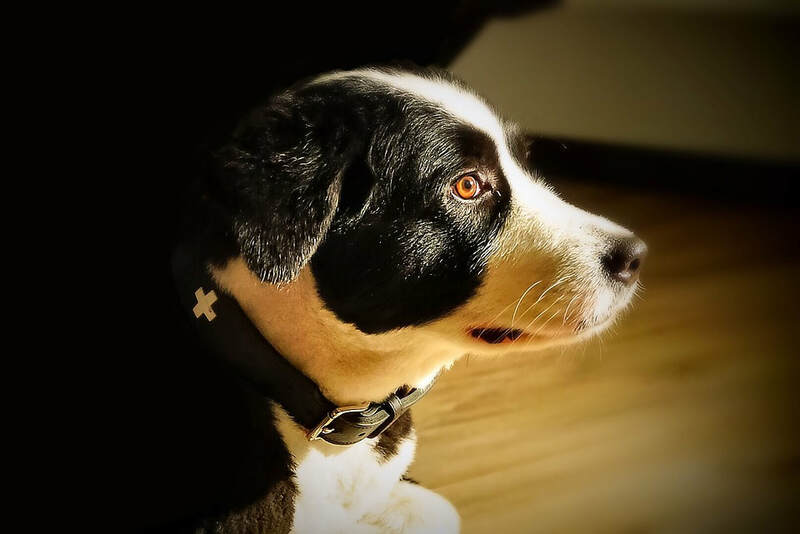 For more information about Chaser, you can check out her website, ChaserTheBorderCollie.com, or follow her on Chaser's official YouTube channel, Facebook page, or on Instagram. You can also pick up a copy of her book, Chaser: Unlocking the Genius of the Dog Who Knows a Thousand Words on Amazon. Border collies celebrate Christmas in many different ways.... some get ready by playing in the snow, or doing fun tricks, while some even help decorate the Christmas tree! In the first video below, Nana gives a special message to viewers while demonstrating her impressive array of cool tricks. Nana the border collie is quite a talented trickster! In the following video, Tess and her sister have lots of fun in the snow. Tess also shows off her amazing tricks and even uses her skills to help decorate the family Christmas tree. 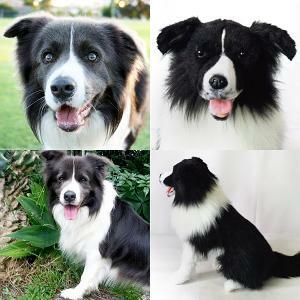 You can follow these incredible border collies on YouTube at NanaBorderCollie and DessTesss. What are your border collies doing during the holidays? New tricks? Digging in the snow? Endless fetch sessions? Let us know in the comments below, and have a wonderful holiday with your pups! 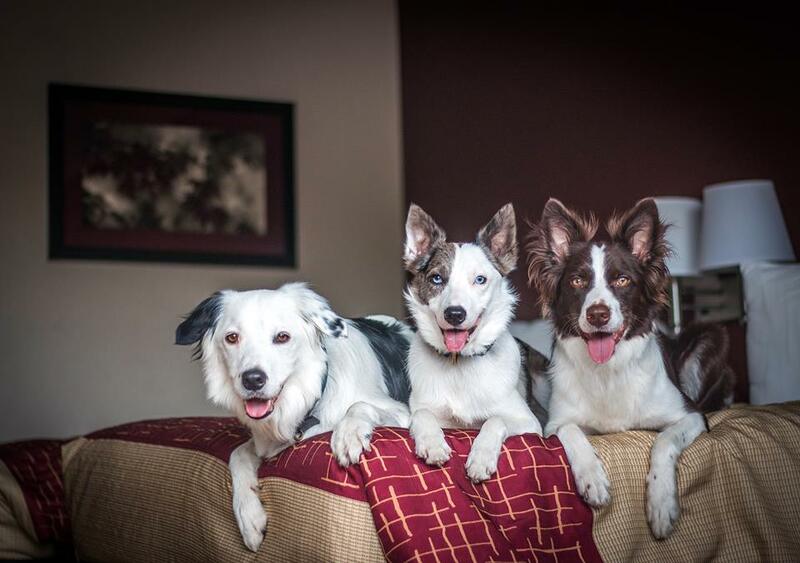 Have you heard of a talented trio of border collies that travel North America to show off their amazing tricks and promote positive reinforcement? Hero, Marvel, and Loki, along with their human Sara, are a pretty amazing team. Together, they travel the country performing at all kinds of events, and teaching trick workshops for people and their dogs. Known for their recent appearance on season 12 of America's Got Talent, where they made it all the way to the finals and finished in the top 5 overall, this talented crew has been seen on stages of all sizes. 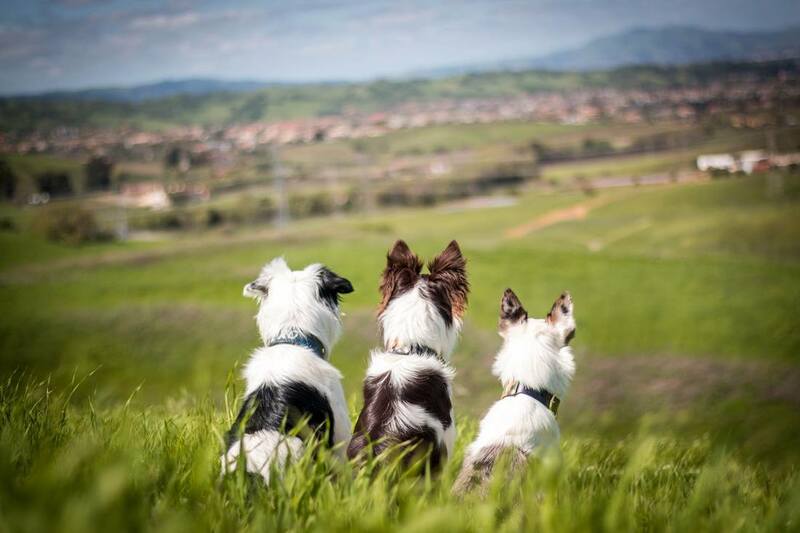 At five years old, Hero (black and white), is the trick veteran of the group and has been learning all kinds of tricks since he was a pup. Hero even earned his champion trick title at just four months old! Since then, he has added several more titles to his name and enjoys practicing and competing in agility, disc, dock diving, and more! He has a particular talent for tricks and doggy dancing (aka canine freestyle) and has many amazing routines under his belt (such as the one above) that have inspired millions of viewers. Hero was the biggest star in The Super Collies' performances on America's Got Talent. He stole the show as the solo dog alongside Sara in the auditions and judge cut shows before being joined on stage by the other two pups in the later rounds of the competition. 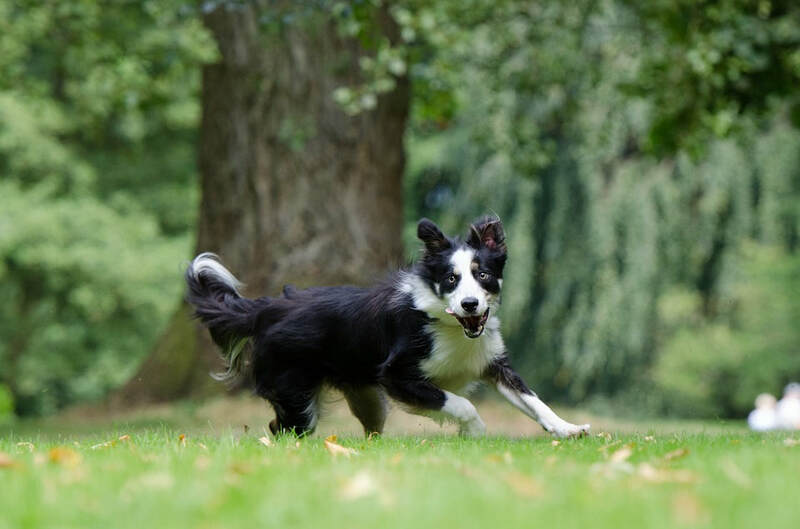 Marvel (brown and white) is a two year old border collie who excels in agility and frisbee. She was a rescue from a family in San Francisco when she was eight months old. 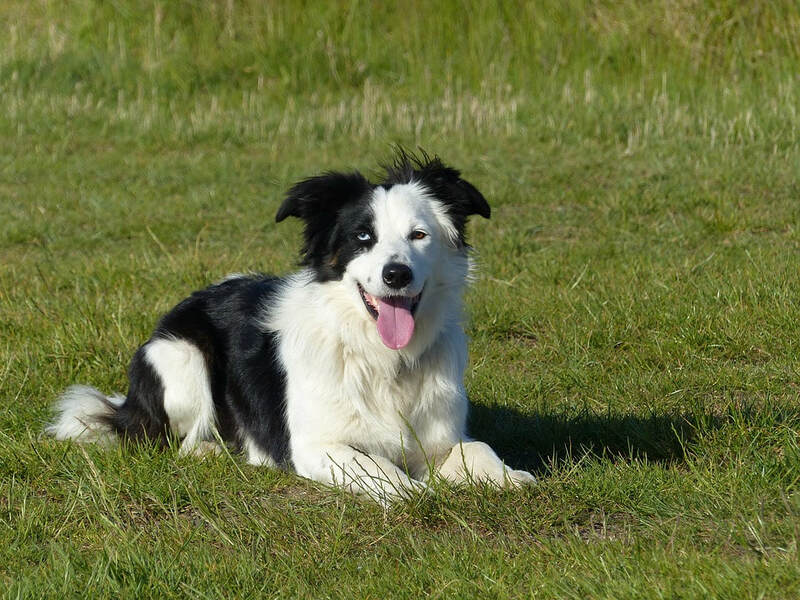 She came with some dog reactivity issues, but has flourished into a pretty happy, talented super collie in the short time since she has joined the crew. She even made an appearance in the 2017 finals of America's Got Talent along with Sara, and her doggy siblings Hero and Loki. *Above* The Super Collies performing in the finals of America's Got Talent. Loki (merle) is a one year old border collie, and dubbed as the baby of the group. He's also the smallest of the gang, weighing in at just thirty pounds. This little guy was rescued when he was only six weeks old, and at just eight weeks old, he participated in his first live performance! Loki is a super talented trick dog, and has been learning new tricks at an impressive rate. At his young age, he already knows over 400 behaviors, in addition to agility, frisbee, and canine freestyle. He is following closely in his big brother Hero's paw prints! Loki also starred in America's Got Talent alongside Hero and Marvel. Loki participated in all three live shows on AGT (the quarter finals, semi finals, and finals), stealing the show with his amazing tricks and adorable puppy antics. Their trainer, Sara Carson (you can follow her on Facebook here) has been training dogs for years, starting with her family's cocker spaniel when she was young. Sara ran her own dog training business in Ontario, Canada for over five years before taking to the road to travel with Hero. Sara and Hero have been seen together on the radio, TV, and countless live performances. Along with America's Got Talent, they have also appeared on The Late Show with David Letterman, the Marilyn Denis Show, and so much more. Hero has also been involved in commercials for Petco, the Family Channel, and the Pet Network. From left to right; Hero, Loki, and Marvel. You can learn more about these talented pups and follow their adventures on Facebook, Instagram, or on their website, TheSuperCollies.com. Losing a beloved pet is a heart wrenching time for any family. The passing of a pet takes a huge toll on everyone, especially if you have kids that have never experienced the loss of a pet before. Oftentimes, cherishing your pet's memory in some form or another can bring closure and peace to all members of the family, and leave a special imprint of the pet's life in your home for years to come. Whether a simple gesture like carrying their collar tag on your key chain, or more extravagant memorials like turning your pet's ashes into a fireworks display or diamond ring, this list will cover all kinds of options that pet owners have to immortalize the memory of their beloved pet. The ideas in this list include DIY projects, as well as creative and customizable store bought memorials. There are ideas suitable for every budget in this list, ranging from subtle things that spark favorite memories of your pet, to much more elaborate gestures, and everything in between. 1. 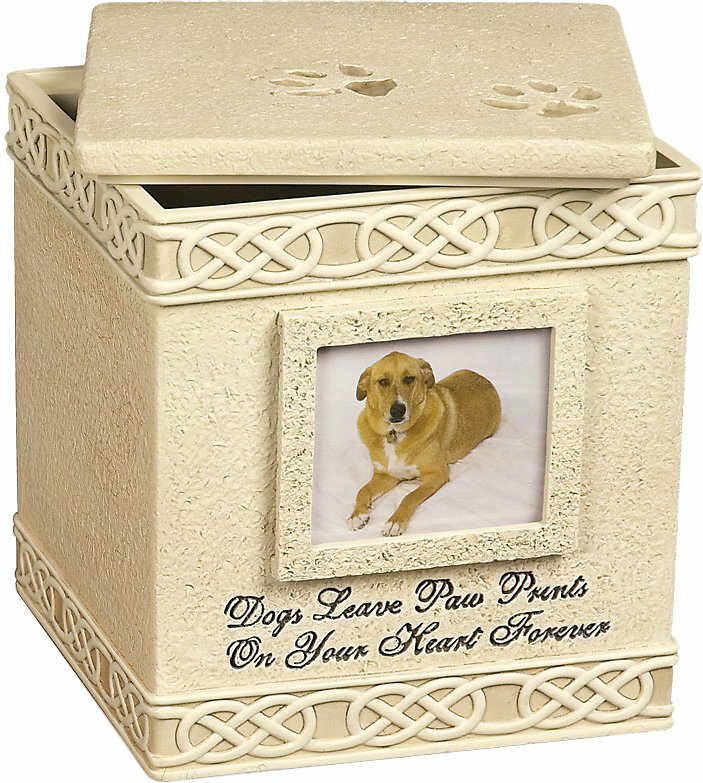 Dedicate a small area in your home to the memory of your pet. This could be a shelf on your bookcase, a single decorative shelf nailed up on the wall, or some other similar designated area to display a collection of your pet's most memorable things. 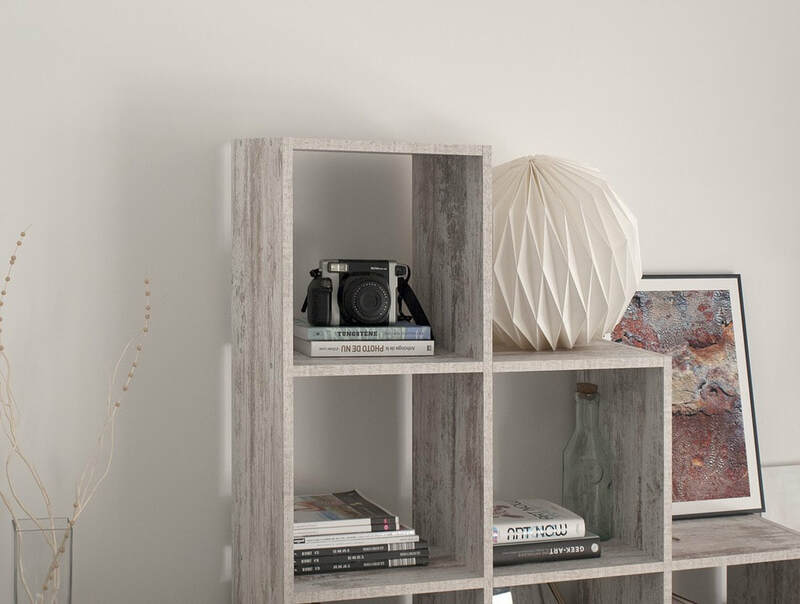 Some people like to find a location for the shelf where it's front and center in their home, whereas others might find the constant memories too painful and opt for a less traveled area in their home, where they can look at it when they want to feel connected to their lost friend. 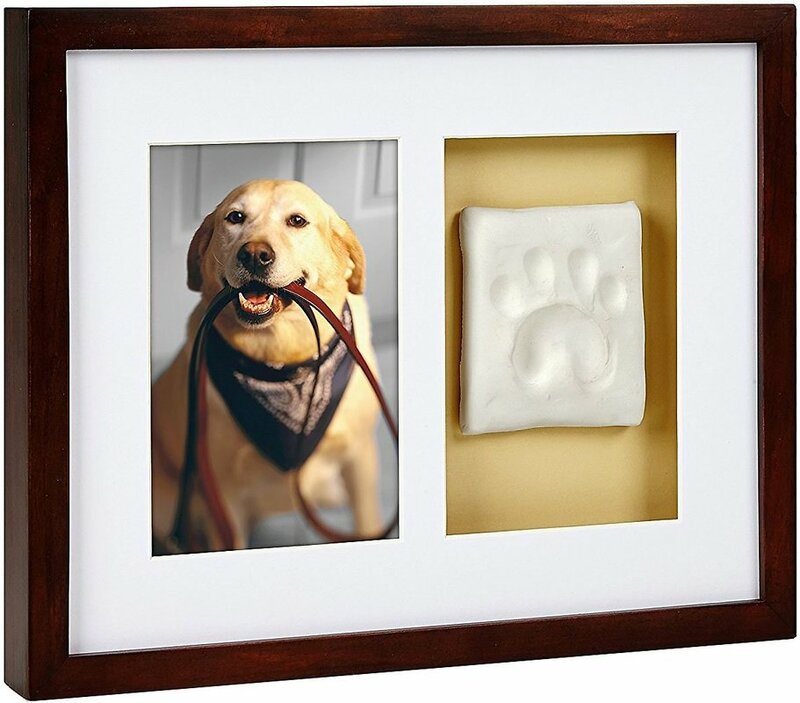 On your pet's display shelf, you can create a photo display with some of your favorite photos, and also include sentimental items like their favorite toys, bandanas, a lock of their hair, their collar, tags, urn, and similar items that remind you of your pet and bring back fond memories. 2. 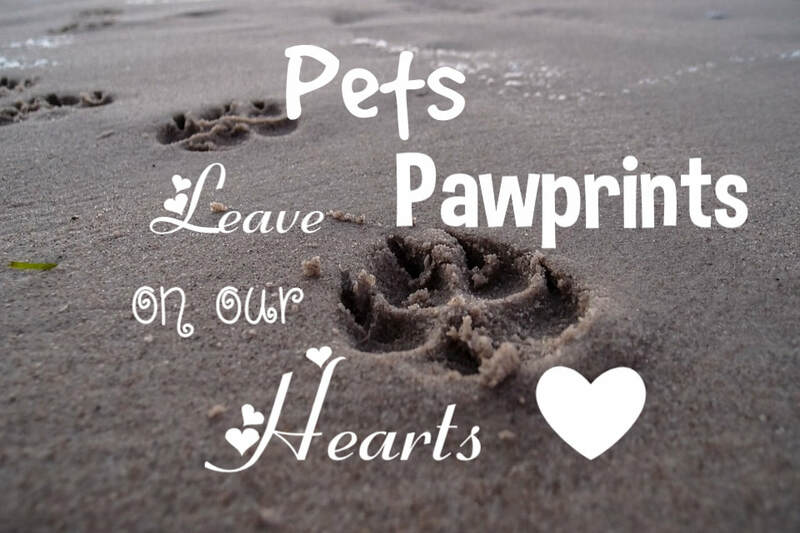 Read quotes about pet loss and choose a quote or poem that stands out for your pet. 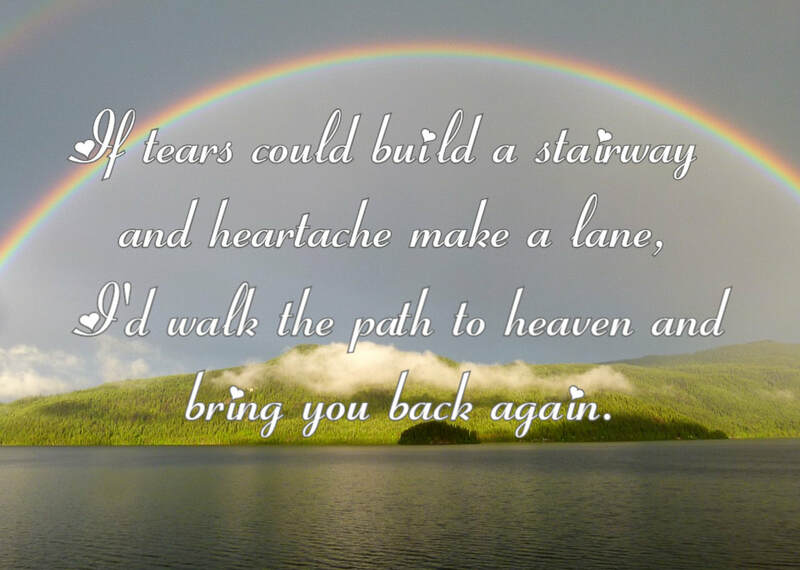 Read through collections of quotes and poems about pet loss on Google or Pinterest. Reading poems and quotes can be a great way to bring back memories and let your emotions loose. Pet loss poems often make you cry, but they have a magical way of leaving you feeling inspired and uplifted after all the emotions spill out. While you sift through the collection of poetry, choose one that really resonates with you. Print off that particular piece of writing and frame it, alongside a photo of your pet. Put it in a place where you can read it whenever you miss your pet or want to get your emotions out. 3. Hold a funeral for your pet in your backyard. A formal funeral can be a good experience for kids and the family as a whole. It helps everyone come to a final closure, express their feelings together, and make the pet's life feel important and meaningful. You can invite other family members and friends if you choose, or keep it a quiet, small event with the immediate family. Take turns telling favorite stories about your pet, their funny antics, and what you loved about them the most. 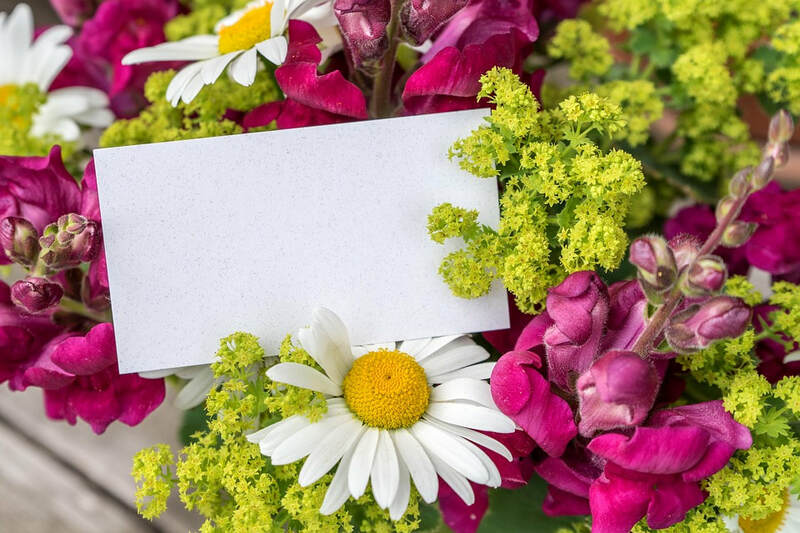 After everyone shares their stories and leaves a flower in their memory, you can spread their ashes (if you choose) and say your final goodbyes. 4. Keep your pet's ashes and/or a final lock of hair. Keeping a beloved pet's ashes or lock of their hair in an urn or memorial box in your home is a common way to keep a piece of them close to you after they're gone. 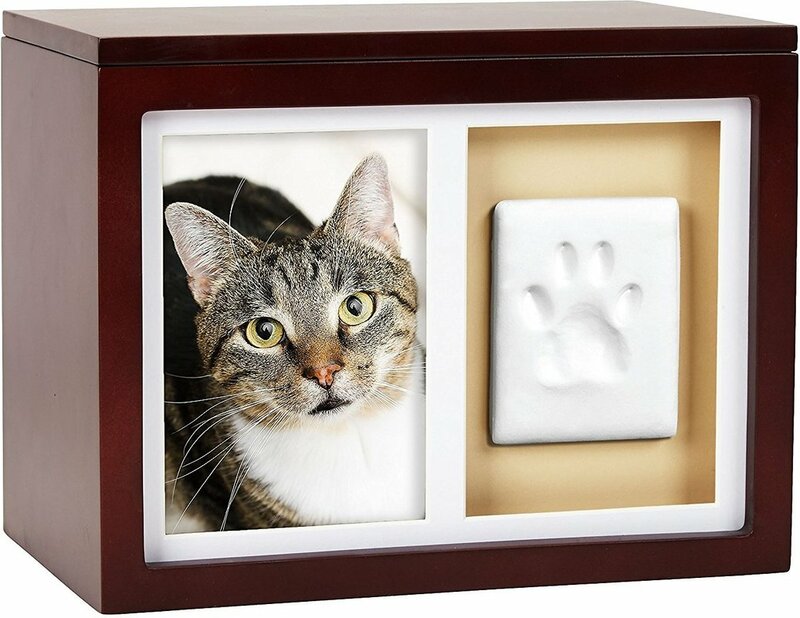 Urns and memorial boxes go nicely on a display shelf alongside photos of your pet, or they can be put away in a safe box or time capsule for future memories. 5. Cuddle Clones or custom pet figurines. Another interesting option to keep your pet's memory alive is to purchase a lookalike stuffed animal or custom figurine from CuddleClones.com. 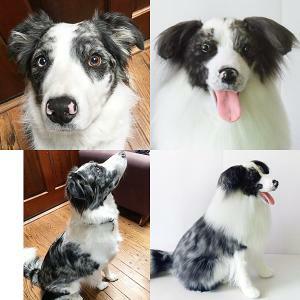 Cuddle Clones specializes in creating realistic, custom stuffed animals that look exactly like your pet. All you need is a couple photos to send in and a few months to bring your creation to life. Cuddle Clones originally started out with cats and dogs, but after many requests, they now do all kinds of animals; their photo gallery features horses, pigs, rabbits, birds, hamsters, guinea pigs, reptiles, and even fish! You can also order sandstone figurines of your pet to put on display in your living room. 6. Share your pet's story online. Losing a pet is hard, even more so when people around you don't quite connect with your pain or completely understand how you're feeling at the moment. It can be therapeutic to take some time to share your pet's memory with others, and read stories of other people's beloved pets. Websites like those listed below allow you to cope by sharing your pet's memorial online and reading stories from those that are also going through the same thing. 7. 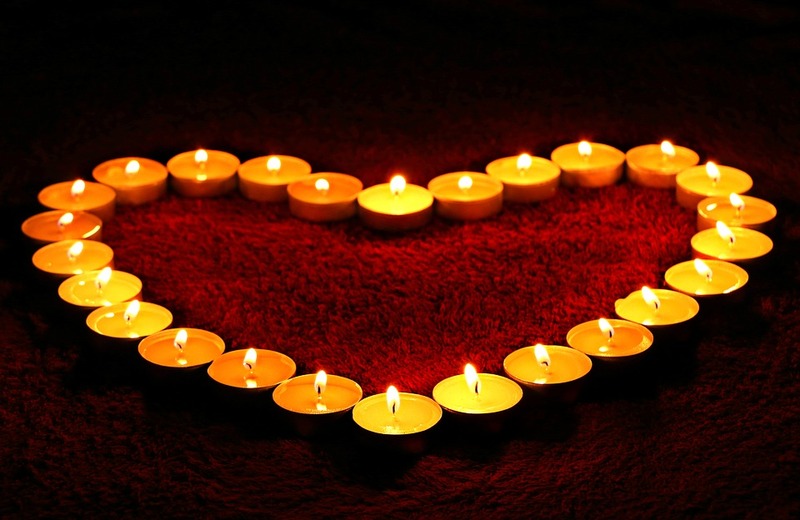 Light a candle (virtually or in real life) in memory of your pet. 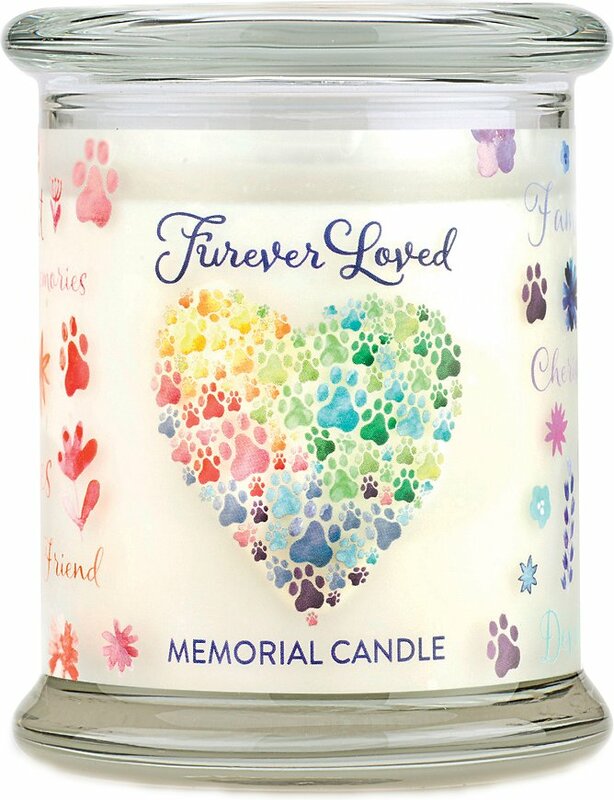 While on the online topic, there are also some websites out there that will let you light a candle online (along with a short blurb about your pet) as a tribute to your best friend across the rainbow bridge. Some good websites to check out are Gratefulness.org and Light-candle.com. You can also take this idea to real life and light a memorial candle in your home every night for thirty days (or until the candle runs out) as an extended tribute and prayer for your beloved animal friend. You can also fasten your pet's collar around the candle jar to add a special touch of your pet to the candle. 8. Put up a photo display or collage on your wall with a collection of your favorite pictures. Wall photo frames, with individual frames for multiple photos (shown below) can be purchased online or at local stores in your area. You can even get creative and make your own photo wall collage. 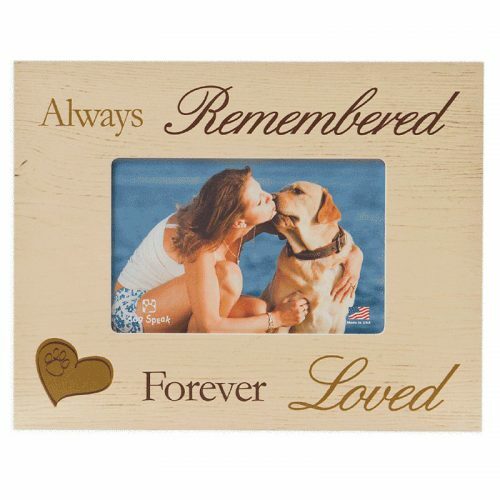 These frames are a great way to dedicate an area in your home to your pet's memory, especially if you have limited floor or shelf space to do so. Photos are one of the best ways to keep a pet's memory alive and make you smile at all their funny antics and the things you loved to do together. 9. 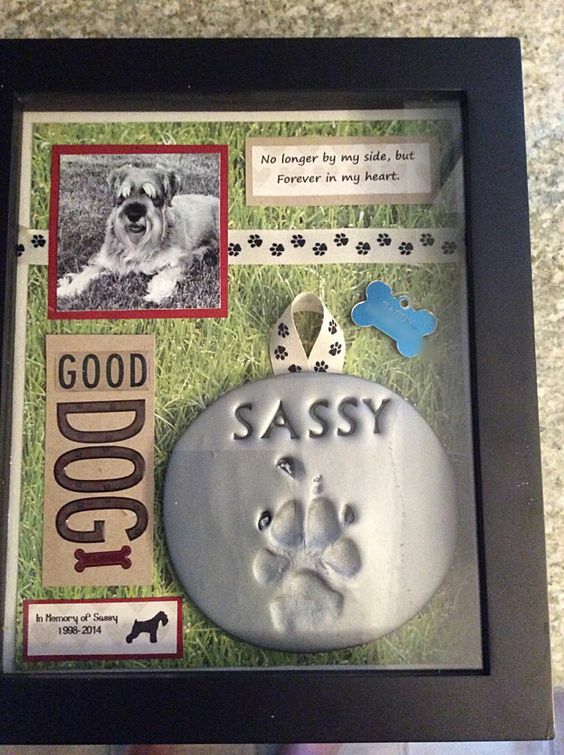 Look on Etsy for creative pet memorial options. Etsy is a marketplace of people who make handcrafted and often custom designs for all kinds of occasions. If you're looking for something special and custom to keep in your pet's memory, you will be sure to find something that's one of a kind. 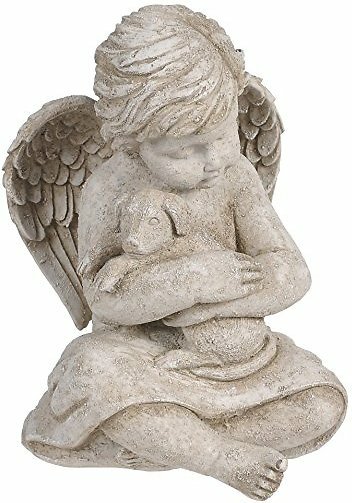 To get started, simply head over to Etsy.com and search their listings for "pet memorials" or "pet loss." 10. 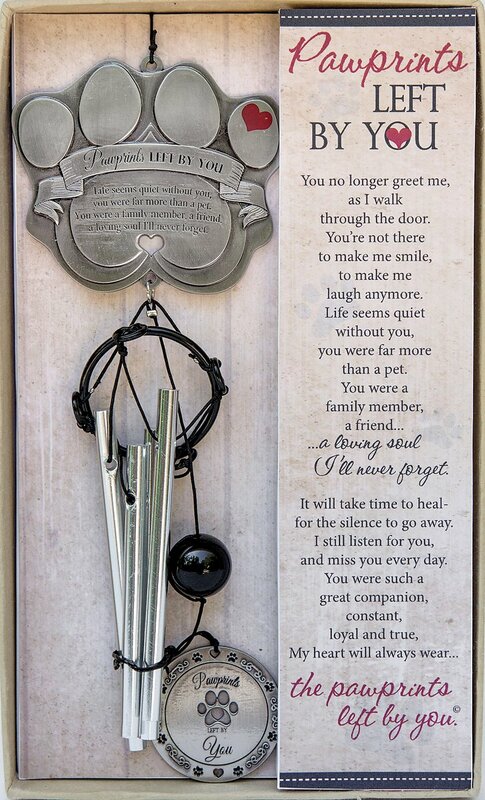 Purchase or make your own engraved plaque or gravestone for your pet. 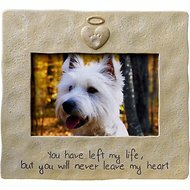 A personalized plaque or gravestone is a popular way to remember your pet and put them to rest. Plaques can be as simple or as elaborate as you choose. Many people choose a simple engraving with the pet's name, date of birth, and date they passed away. Some people also include a short message, or even get their pet's picture engraved onto the stone. Regardless of what you choose, having a designated place where you can connect with your pet is a good idea and also provides a great place to plant flowers or visit when you miss your pet. Plaques and gravestones can be found in local stores, online, or you can even make your own personalized grave for your pet. 11. 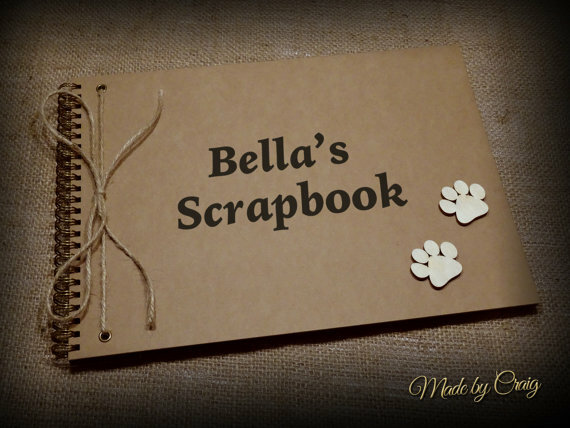 Make a scrapbook for your pet, or dedicate a page in an existing scrapbook to their memory. Putting your pet's photos in a scrapbook or photo album is a great way to bring memories back at a later time and make you smile. It's also a great activity you can do together with your kids to help them feel involved in your pet's legacy. If you opt to make a mini scrapbook exclusively for your pet, there are lots of cute handcrafted books on Etsy and other similar sites that work perfectly for this purpose. 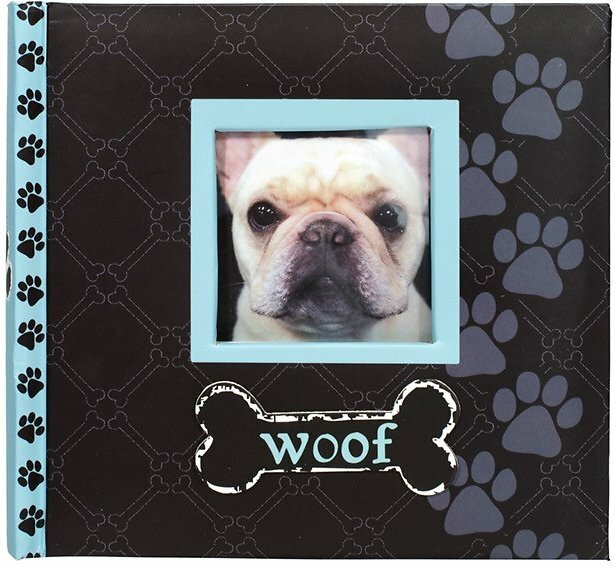 Purchasing a handcrafted scrapbook adds a personal touch and many pet scrapbooks include cute aspects like pawprint designs and other pet related features. Additionally, you can also create your own fun little book simply by stapling some colored construction paper together and letting the kids decorate with stickers and glitter. 12. Create a time capsule of your pet's most memorable items. If displaying your pet's things in a visible place makes you sad at this time, you can opt to put everything that reminds you of your pet in a dedicated memory box instead. This could be as simple as a cardboard box, or a more elaborate pet memorial box with a spot for your pet's photo on the outside. If you enjoy woodworking, you could even make your own handcrafted wooden box. If you have a plain wooden box for your time capsule and want to spruce it up a bit, you can also decorate it a little, adding elements that remind you of your pet. You can even put your pet's favorite picture in a wooden frame, and glue the frame to the front or top of the box for an additional special touch. A time capsule can contain all kinds of items that bring back memories of your beloved pet; anything from their favorite toys, collar/harness/leash, bandana, photos, a video slideshow on a disc or USB drive, or even their ashes/urn if you prefer not to have it in constant sight after they pass away. Put your pet's memory box away somewhere safe, and someday when the initial pain of losing them has subsided a bit, your pet's time capsule will surely bring back memories of all the happy times with your pet. Whether you're a believer of animal communication or not, these types of consultations can really bring closure to some people. There really is some comfort in hearing something that your pet would like to say to you when you can no longer hold them and speak to them yourself. Make sure you look for an animal communicator that has lots of previous happy clients and are good at what they do. 14. 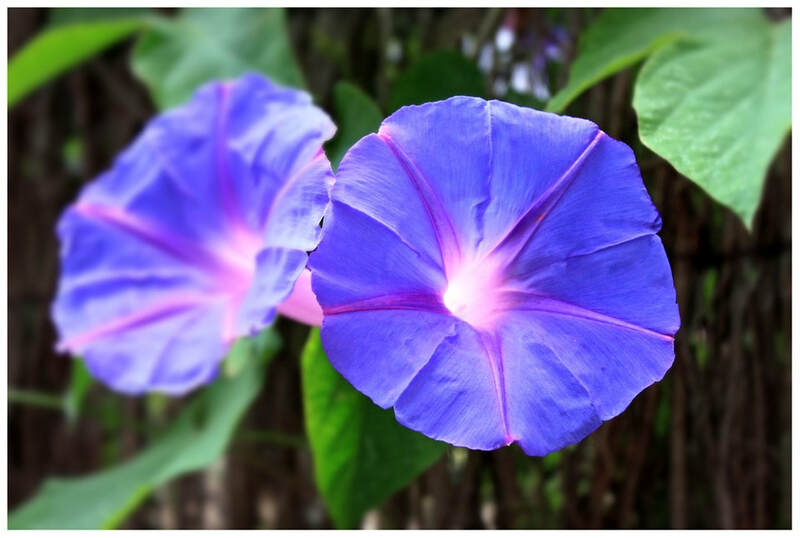 Plant a tree, bush, or perennial flower at your pet's burial place or favorite area in your yard. Planting something in honor of your pet is another popular way to remember your pet. In many ways, planting something new represents new growth and an everlasting life of your pet in a new form. If you had a color you used primarily for your pet (perhaps their collar/harness/leash, etc. 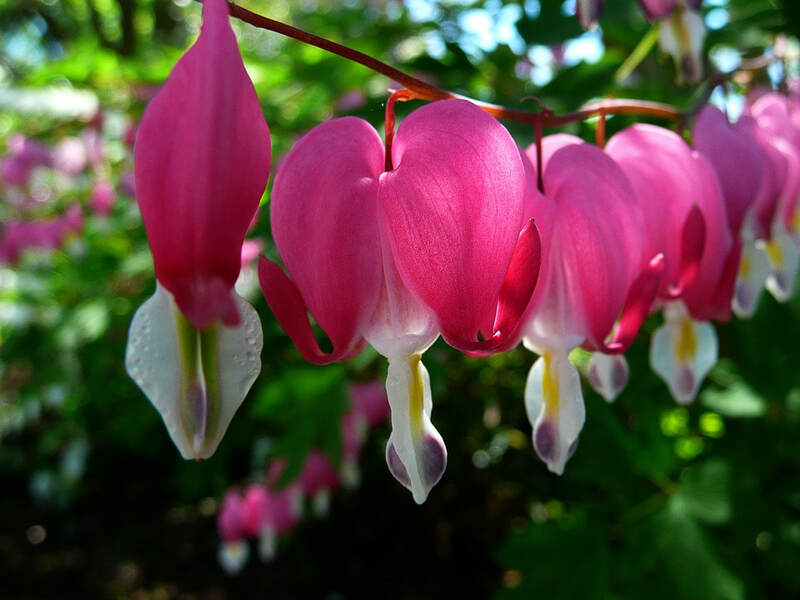 were all pink) consider choosing a perennial plant that will come back every year with pink flowers. Or perhaps, if your pet liked to jump in leaf piles in the fall, find a plant that has a bloom time in Autumn. 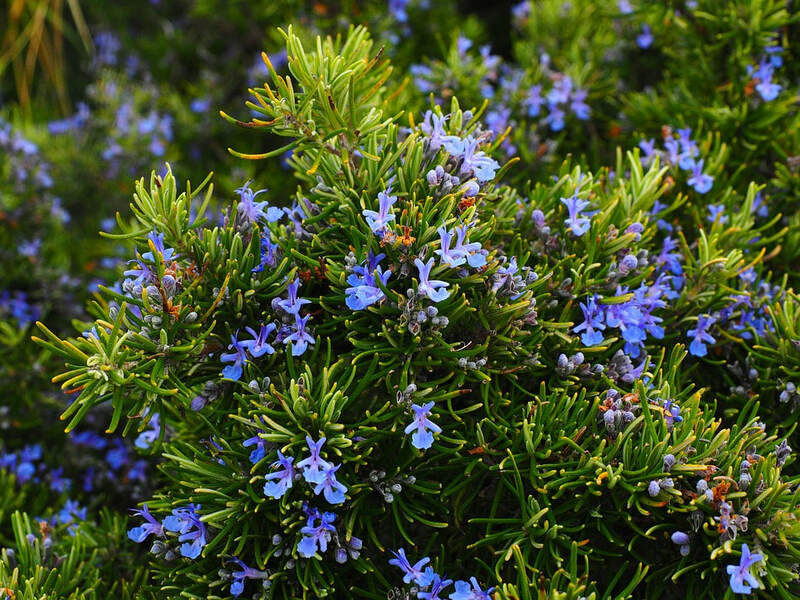 These seemingly little things can be a subtle reminder of your pet every year when you see their plant in full bloom. You can even plant some of your pet's ashes in the ground with their new tree. 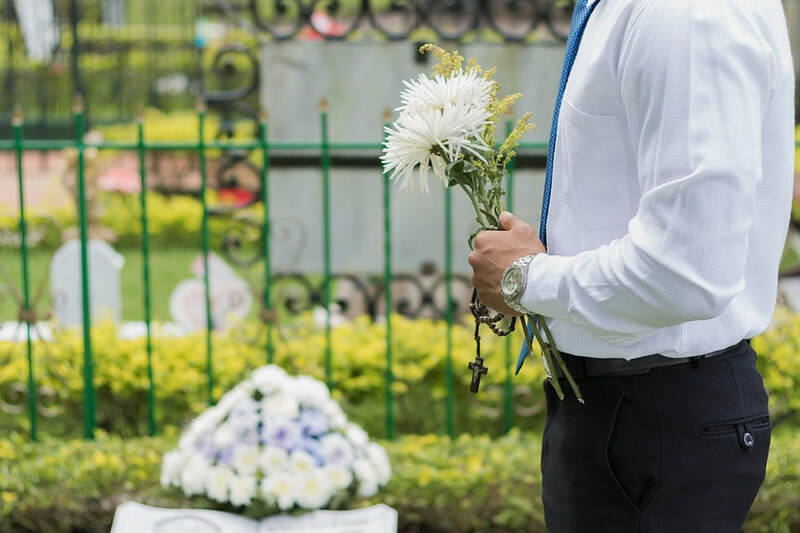 Burying ashes in the ground can be seriously damaging to the new plant however, so check out a website like Let Your Love Grow to bury your pet's ashes in a safe and eco-friendly way. 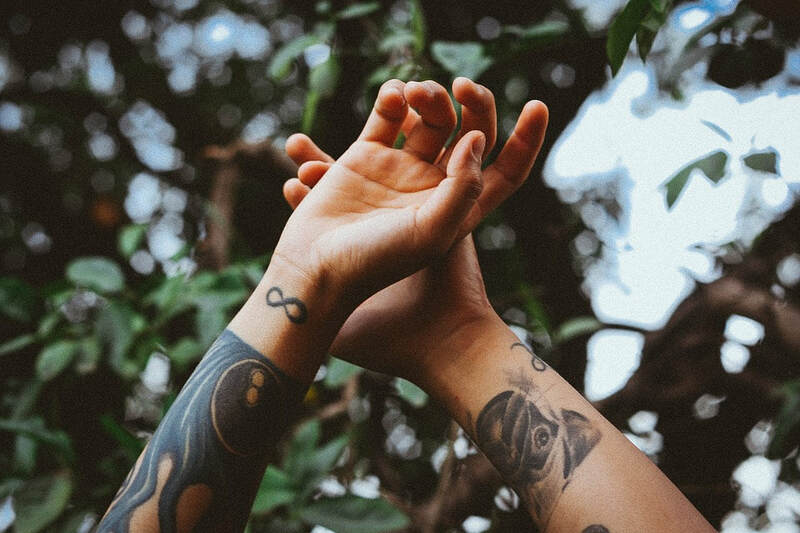 You can also check out Spiritree, a website that offers another eco-friendly, biodegradable option for ashes. You simply place the ashes in the nutrient rich bottom compartment, plant a young tree in the middle, and wait for the sapling to grow up. As the tree grows, it will use the nutrients from the urn to feed itself and grow, eventually breaking out of the urn's protective shell and remaining as a living memorial for your pet. 15. 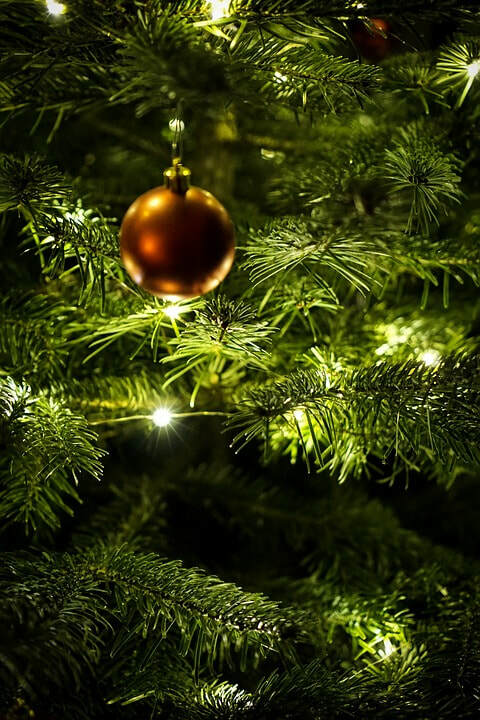 Keep your pet's collar as an ornament for your Christmas tree. A happy time of year revolving around family can be a great time to have a reminder of your beloved furry family member in the home. If you want to spruce up the collar a bit to match the holiday theme, you can even decorate it with some green, red, or gold ribbon, or attach some little bells to add some extra Christmas spirit. 16. Customized Christmas tree ornament for your pet. Building on the idea above, you can also make or buy a cute little ornament with your pet's photo to display on your Christmas tree. This is a good alternative to the idea above if you want visitors to be able to see your pet's photo, or if your pet was a small animal, bird, reptile, or similar pet that didn't have a collar. Making a little photo tree ornament can be as simple as cutting one of your favorite photos into a circle shape, and gluing some cardboard behind for a sturdy backing. You can then punch a small hole at the top and thread a string through to hang it on the tree. 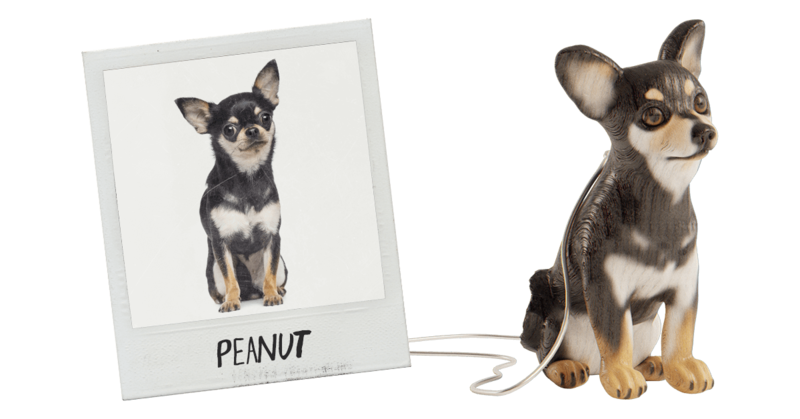 While they are more expensive, you can also find some pretty neat customized ornaments with your pet's name and photo, or even some creative full color sandstone ornaments that can be made to look exactly like your pet. 17. Convert food and water bowls or stands into planters for small houseplants. You can also put your creative side to work and make some mini planters out of your pet's bowls, or even put together a cute little fairy garden. 18. Make a bracelet out of your pet's collar or leash. 19. Clip your pet's collar tag onto your bracelet or key chain to carry with you. Similar to the idea above, this simple gesture keeps your pet close to you whenever you wear your bracelet or reach for your keys. In the case of dogs, your beloved furry friend often goes everywhere possible with you. A simple act of attaching their collar tag to your key chain symbolizes exactly that, by continuing to keep your pet close to you wherever you go. You can choose to keep the tag totally natural, or cover it over with a glossy coat of glaze to add some shine and preserve the natural look. If you lost a pet other than a dog, or don't want to use their collar tag, you can also attach a key chain with a photo of your pet instead. 20. Chain jewelry or a wallet chain. 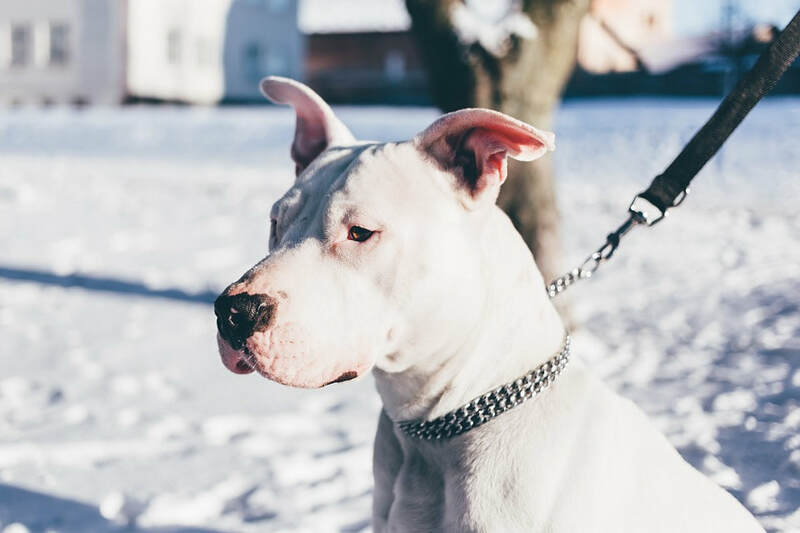 If your pet had a chain collar or a link of chain in their collar or leash, you could take it apart and use the chain as a decorative bracelet or a wallet chain. A pet chain would make a great charm bracelet, and you could easily attach your pet's tag to it (like in idea # 19 above.) If you already happen to have a charm bracelet, you can also find a charm that symbolizes or reminds you of your pet in some way and clip it onto your existing bracelet instead. 21. Donate to an animal shelter in memory of your pet. Donating to an animal shelter in your area is a great way to help others in your pet's memory. By supporting the shelter, you might help someone find their new best friend in spite of your own loss. Some shelters also accept sponsors for their animals' cages, where they will put a short message of your choice on one of their cages for a year. That can be a good way to share your pet's memory with others while also supporting a good cause. Letting your creative juices flow into a piece of writing about your pet can be quite therapeutic. Writing a message about your pet, or writing directly to them can be a great way to express your emotions, regardless of whether you consider yourself to be a good writer or not. A letter or poem can be a very personal and expressive way to show your feelings and really understand how you're actually feeling about the loss of your pet. 23. Get a tattoo of your pet or a symbol/letter that represents your pet. If you're into tattoos and want a more permanent way to honor your pet, you may consider getting a tattoo of your pet's picture, name, first letter, pawprint, or some other kind of symbol that is representative of your pet. A tattoo can be a great tribute to your furry friend, and a great way to keep them close to you forever. 24. 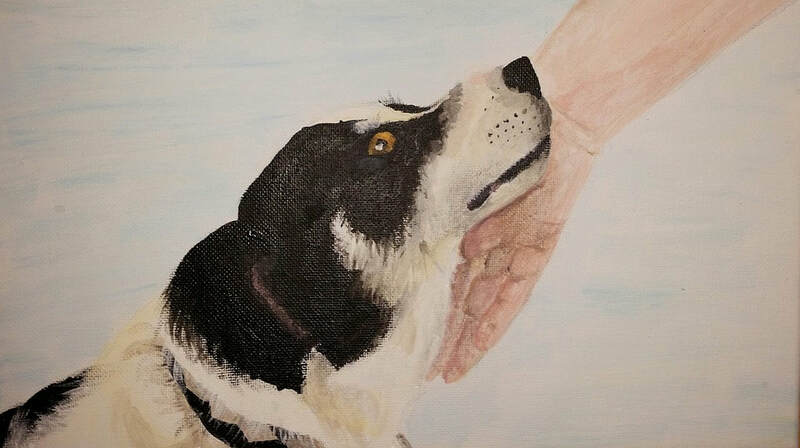 Purchase a custom painting of your pet. A custom painting is a creative way to keep a beautiful memorial of your pet in your home. A painting can really bring even more life and emotion from a picture, and can transform your favorite photo into a true work of art. You would also be supporting an artist's work, in addition to having a unique, one of a kind piece of art to remember your pet. 25. Share something your pet loved. Think about something your pet loved more than anything else. Tennis balls, frisbees, feather toys, catnip toys, your pet's favorite brand of treats, or any other special item that reminds you of your pet. For example, if you had a dog with a fascination for tennis balls, you could share that with other dogs by leaving a small box of tennis balls at your dog's favorite park for other dog owners to play with their dogs. Leave a poster with a picture of your pet and a short blurb about their favorite toy so others can read their story and appreciate the gift from your pet to theirs. 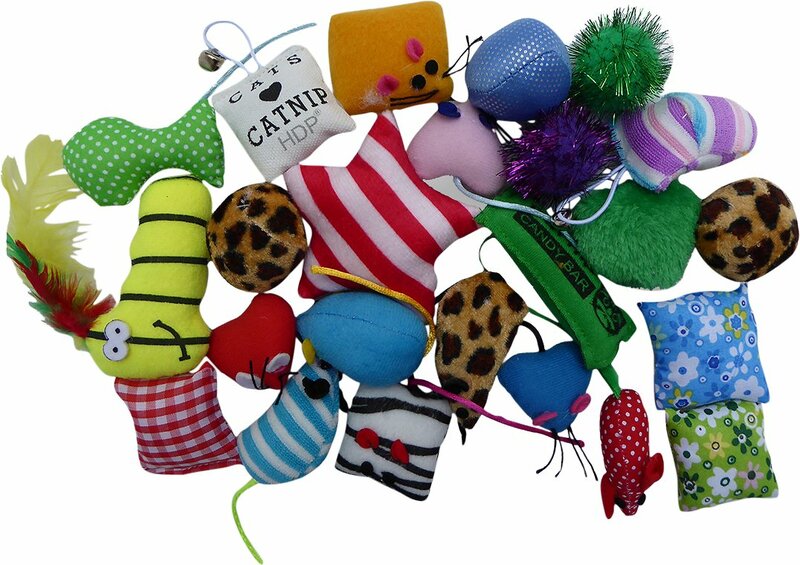 If your cat loved catnip toys, you could buy several and donate them to your local animal shelter. There are so many different ways to share your pet's favorite things and bring enjoyment to all the other pets that are out there now. 26. Make memorial cards to send out to family and friends. If you like to make your own cards for holidays and special occasions, this can be a nice way to share all your favorite memories of your pet with friends and family. Relatives and friends that also loved your pet will be happy to receive a card in their honor, and it can be therapeutic to share the memory of your beloved pet with others. You can include some photos in the cards, in addition to your pet's date of birth, and date they passed away. 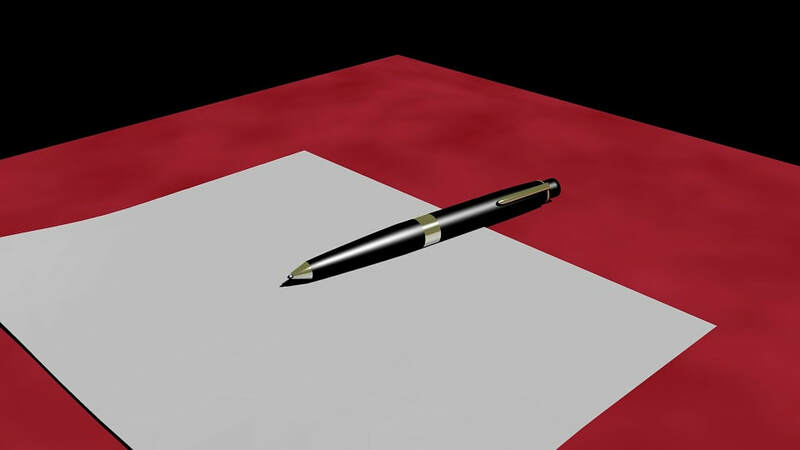 You may also want to include a short memorial message and a memorial poem or quote that stands out to you. If you don't know how to make your own cards but have an interest in learning, check out Canva.com or Adobe Spark to try your hand at making some DIY greeting cards for free. 27. Create and publish a free eBook about your pet's life. If you love to write, creating a free eBook about your pet's life can be a therapeutic way to re-trace your pet's life and share it with others. 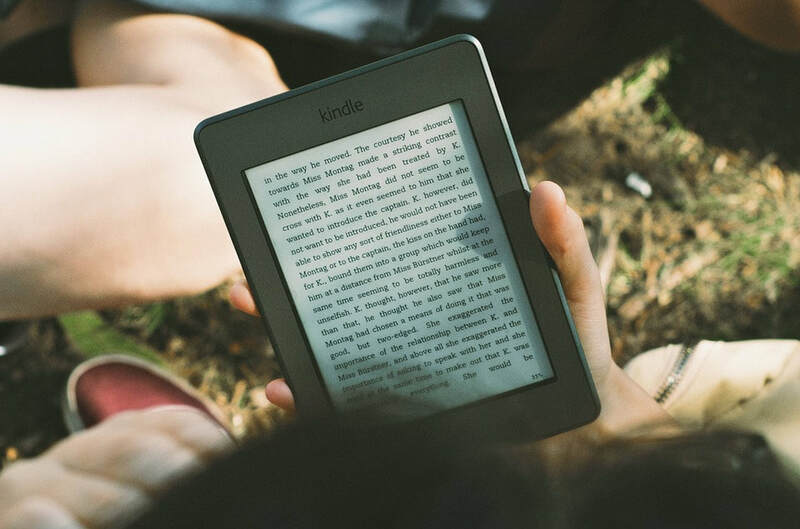 An eBook can be as short or as long as you choose, and can include your pet's funniest or most memorable moments, best stories, and the difference they made in your life, and other's lives. 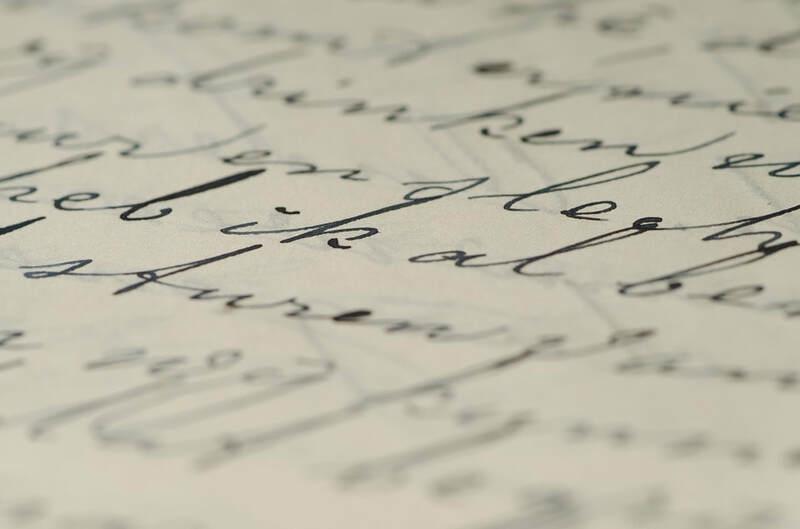 Writing an eBook is a great way to relive all your favorite past memories as you write. Down the road when some of those memories have started to fade, you might be really glad you captured them in the form of a book and can continue to smile as you re-read your story from years ago. 28. Create a website, blog, or Facebook page in honor of your pet's life. An online platform or social media page can be a great way to keep a collection of your pet's best photos and memories in one place. You can easily create a free drag and drop type of website on Weebly.com or Wix.com, or start a Facebook page exclusively dedicated to sharing photos and stories of your pet. 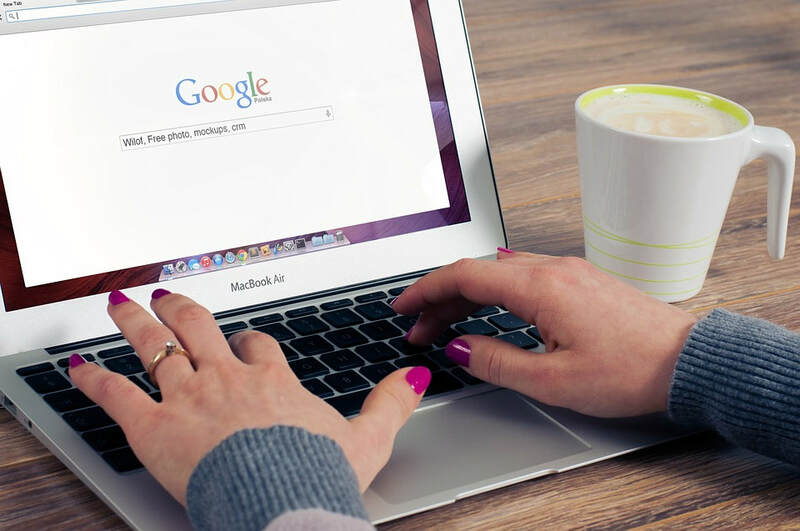 Websites and Facebook pages are easy to set up and you can update and add photos, videos, and other content quickly and easily. Online sites and pages are also super easy to share with friends and family with just a simple link to your page. 29. 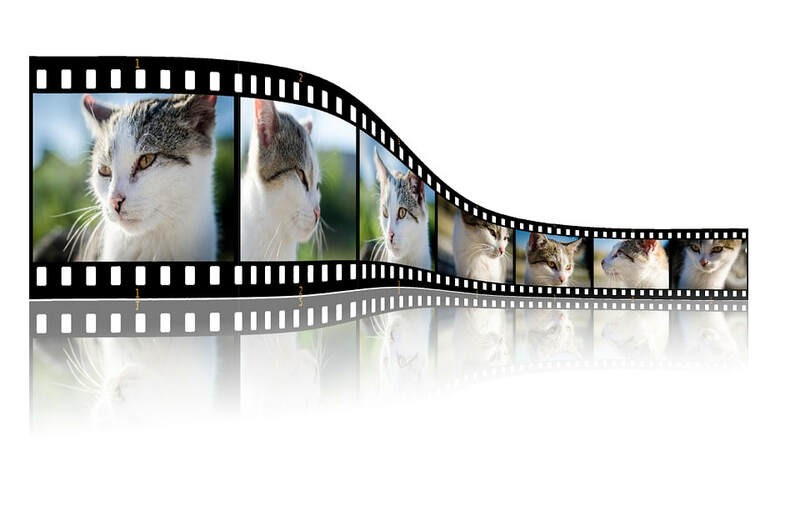 Create a slideshow or video montage of your pet. A compilation video or slideshow is a great way to put together a collection of your favorite video clips and pictures. You can edit these types of videos together using a simple free editing software, such as Windows Movie Maker or something similar. If you choose to share your video with others, you can then upload the finished product to YouTube.com or directly to your social media sites. 30. Make a collage poster of your pet's photos. 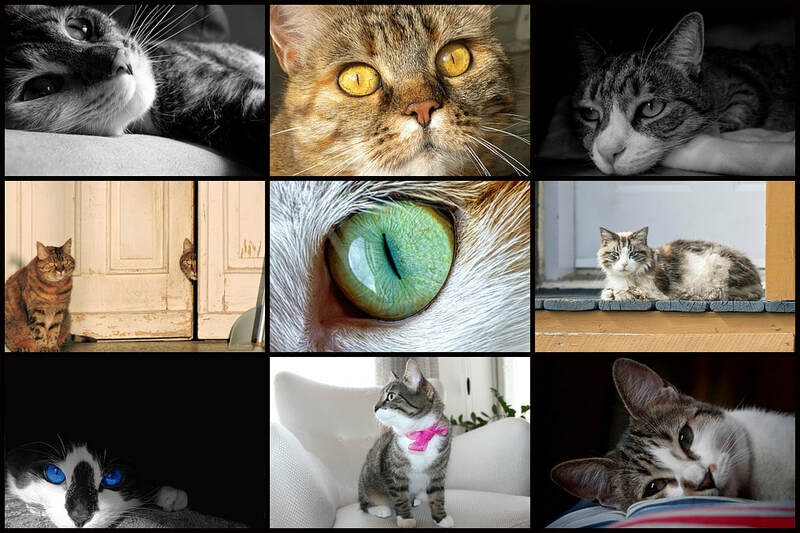 Another fun and creative way to honor your pet's life is to create a collage of photos on a poster board. This is a great project for kids to help out with as well; they can arrange the pictures to their liking and add their own creative flair with decorations and colors around the border. On the back, everyone can write their own special goodbye messages to their beloved furry family member. When this collaborative project is finished, it can be put on display on the wall as a family memorial and tribute to your loved and lost pet. 31. Organize a collaborative online memorial. If you have extended family or friends that also loved your pet, a collaborative memorial could be a good opportunity to involve them in your pet's memorial as well. You may also see pictures that you haven't seen for a long time, or hear different perspectives from your friends and family about how your pet made an impact in their lives as well. For an online memorial, you can simply ask friends and family on social media to post any pictures, video clips, or stories of your pet that they have. Organize everything together into a video compilation, Facebook page, or something similar, and show the finished product to everyone that contributed to the project. 32. Dedicate a small area in your garden to your pet's memory. Stepping stones or decorative statues may also be perfect for your garden. You can even look for some cute solar lights that remind you of your pet, or find planters with dog or cat designs on them to plant some colorful annuals in. 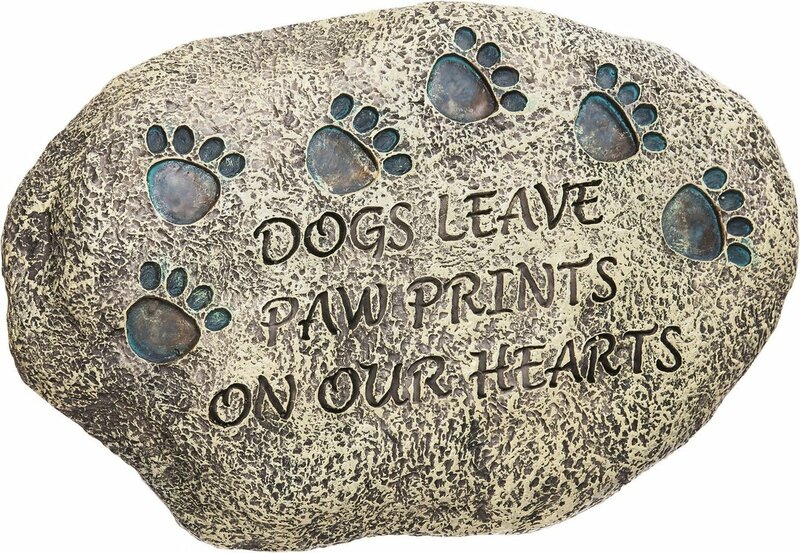 You can even get creative and make your own pet memorial stepping stones with decorative rocks, paw print indents, and of course, your pet's name and a short love message to them. 33. Take other people's pets into your home for boarding while the owners are away. If you have a void left by your pet that you wish could be filled, but you aren't ready for another animal yet, consider pet sitting in your home. You can take other people's pets into your home during the day while the owners are at work, or for extended periods when people go away on vacation and can't bring their animal. 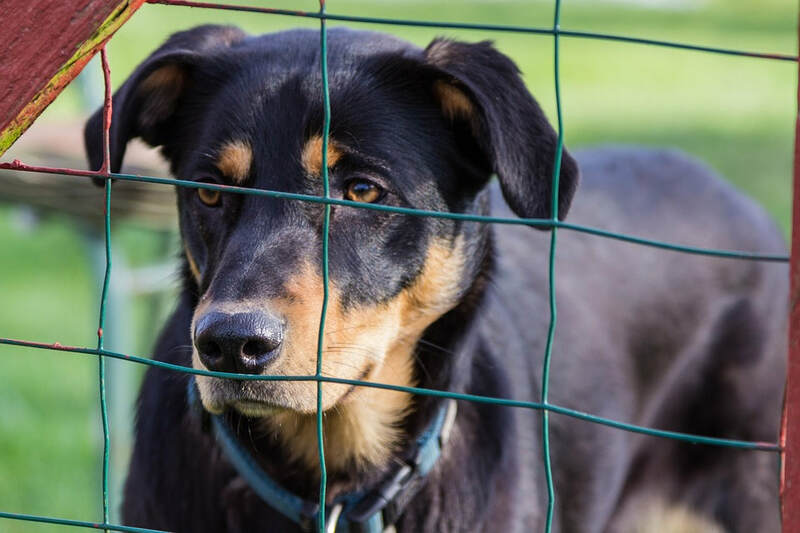 Many people would prefer to leave their pet in a home environment instead of a kennel, and it gives you the opportunity to have animals around and even make a bit of extra money on the side. 34. Create a "Shadow Box" for your pet. A shadow box is a personalized and decorative display box that hangs up on the wall to showcase your pet's best things and commemorate their life. Shadow boxes can be found online or at a craft store, and customized to your preference. Shadow boxes can be designed and decorated in creative and special ways to share your pet's personality. For example, you might choose to do a pink theme for your box to match your pet's bright pink collar and harness set. You can also use your pet's things to decorate the box; a leash for example would make a pretty border around the inside of your box. Laminated photos are also great to include. If you choose to put some of your pet's favorite toys in the box, you can also include a photo of your pet playing with that particular toy to make the memories even more vivid. For more information about shadow boxes, check out this article by cuteness.com. You can also explore more creative ideas for shadow boxes on pinterest. 35. Write an obituary for your pet. If you decide to have a family funeral in your backyard to commemorate the life of your pet, an obituary is a good thing to read during your ceremony. Even if you don't host a funeral for your pet, an obituary can still be shared with family and friends, or even kept private if preferred. In your obituary, include your pet's name, date of birth (and/or when you brought them home), and the date they passed away. You can also add in any canine achievements they received, who they are survived by, and whose lives they touched beyond yours. Of course, your pet's favorite things in life should be mentioned as well; what were their absolute favorite things to do and places to go? Favorite toys, treats, parks, and of course, their best furry friends they met on their adventures. Whether you share your pet's obituary at their funeral, post online for friends to read, frame it on your shelf, or simply hide it inside a folder in your drawer, writing an official post life document for your pet can make a great memorial. 36. Frame your favorite photo of your pet. Sometimes, a photo speaks more than a thousand words, and ends up being the perfect thing to have nearby after your pet passes away. Pick a photo that you especially love, or one that just makes you smile or laugh. You can put it on display where ever it feels right; whether that is right in your living room, office desk, or even just on a dresser or table in your bedroom. 37. 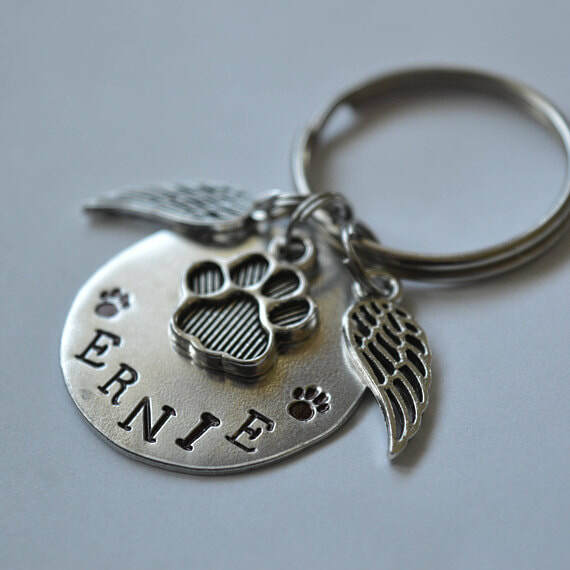 Turn your pet's tag into a decal charm or pendant. This article by InspiredBarn.com shows a super creative way to turn a pet's collar tag into a beautiful pendant to wear on a necklace or key chain. Pet tags can be pretty simple on their own, but with a little design and some glossing up, they can be re-purposed in a whole new way, while still keeping the pet's name intact and serving as a great memorial item. 38. Custom patchwork quilt/photo collage blanket. A custom collage blanket on Etsy. A custom fabric quilt with several photos imprinted on it is a creative way to display some of your favorite pictures. These cute quilts make a pretty creative household addition and are great to snuggle up with on a cold day or when you miss your pet. 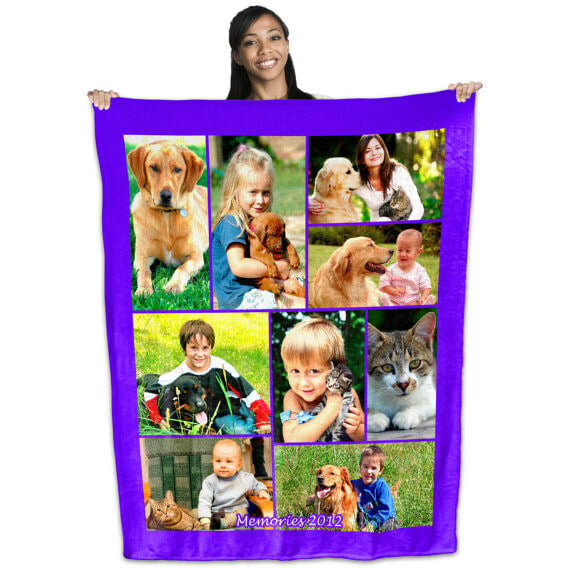 Custom photo blankets can be customized with your pet's name embroidered into the blanket, and background colors of your choice. Combining photos with a blanket is an ideal option if you are lacking shelf space to display photos or don't want to clean and dust around a bunch of picture frames. These blankets can be purchased through Walmart, custom crafted for you on Etsy, or you can go DIY and make one yourself. 39. 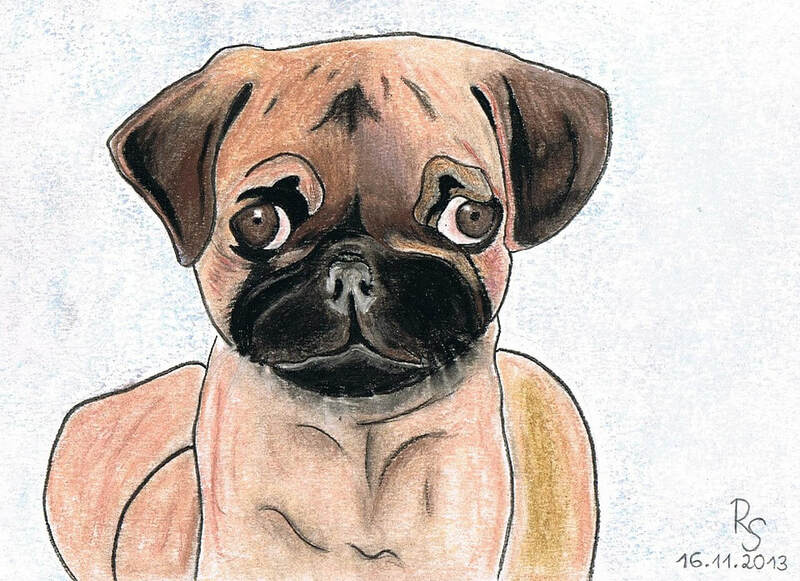 Draw or paint a picture of your pet. This idea is perfect for kids, or talented people that love to draw or paint. 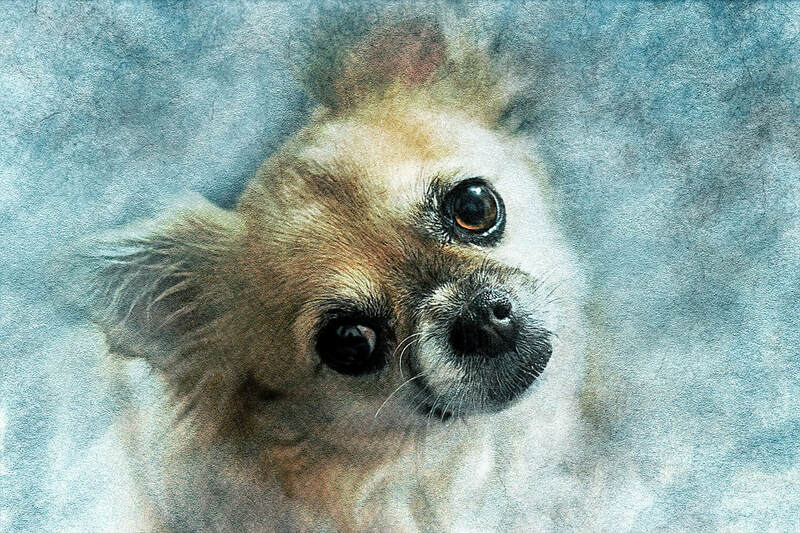 When you're finished, you can display your picture on the fridge or frame it alongside your pet's photos. 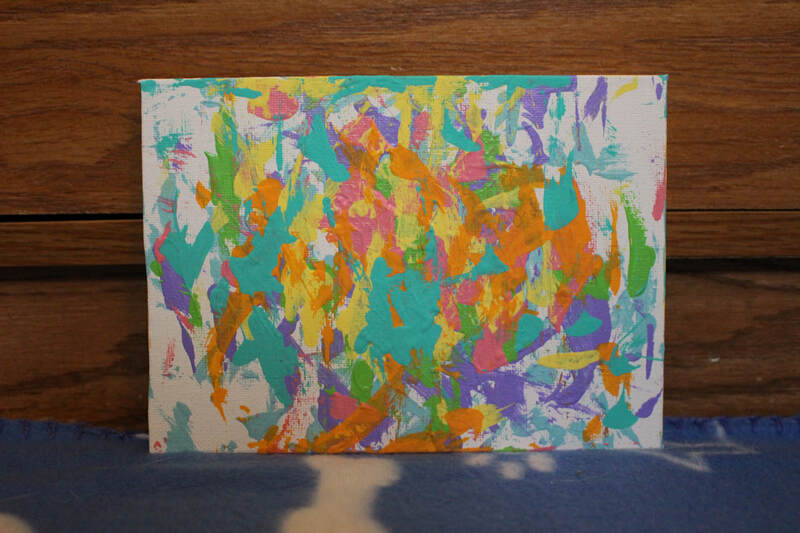 If you're not exactly a budding artist, you can still give it your best shot. Even if it ends up being not quite what you intended, you can always hide it away in a time capsule (idea #12 above) with the rest of your pet's things for later amusement. 40. 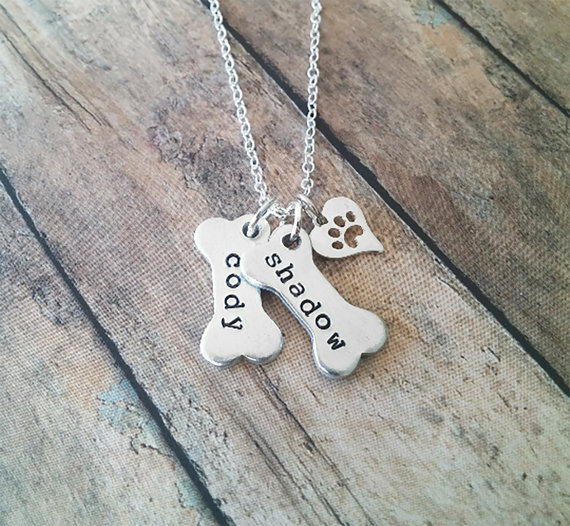 Get a custom necklace of your pet. Necklaces are a great way to keep your pet's memory close to your heart and carry them with you everywhere you go. Cuddle clones offers the option to have a necklace handmade out of sandstone to look just like your pet. All your need to submit is a few photos, and they will carve out a one of a kind necklace and send it to you. Alternatively, these memorial locket necklaces are a little different, allowing you to put a small amount of your pet's ashes in a tiny brass urn. 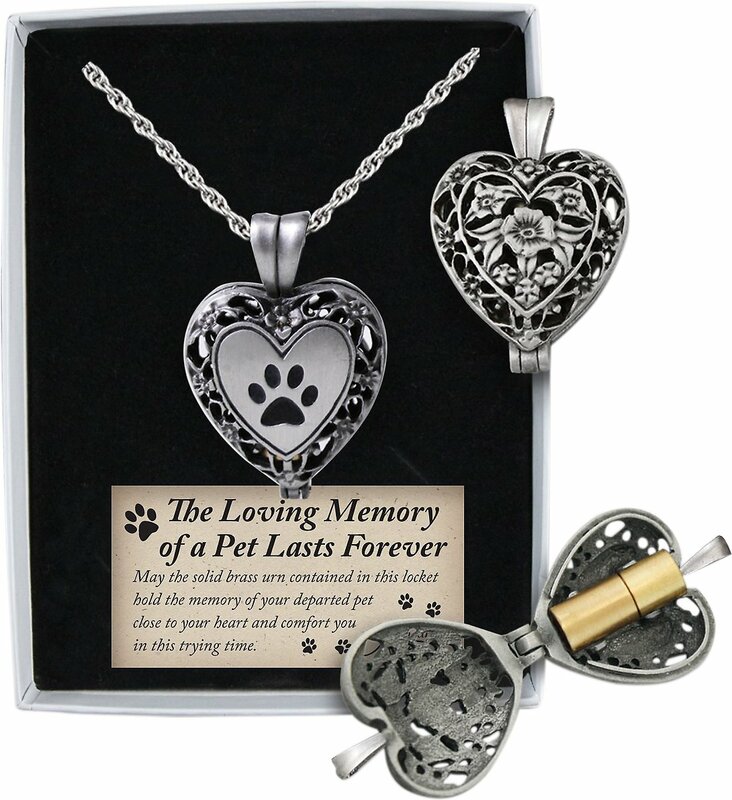 The urn then sits inside the locket necklace, so you can carry a piece of your pet with you wherever you go. 41. Paint your own figurine kit. 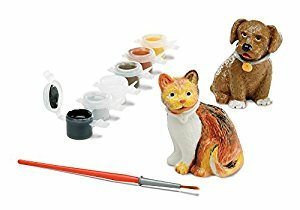 Another good way to involve the kids in your pet's memorial is to purchase a paint your own pet figurine kit. You can paint the figurine to look just like your lost pet, with the same colors and markings. After the figurine is finished, it can be glossed over with a shiny layer of glaze (optional) and displayed on a shelf next to your pet's best photo. 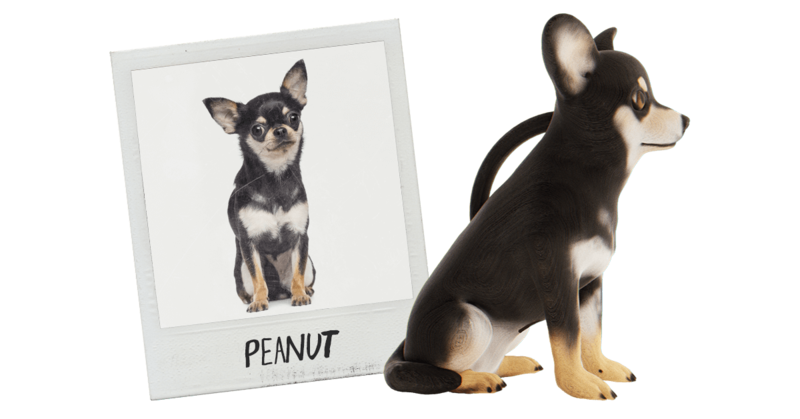 Painting a figurine is a creative way to keep a personalized little 3D version of your pet in your home. 42. Build a birdhouse in your pet's memory. 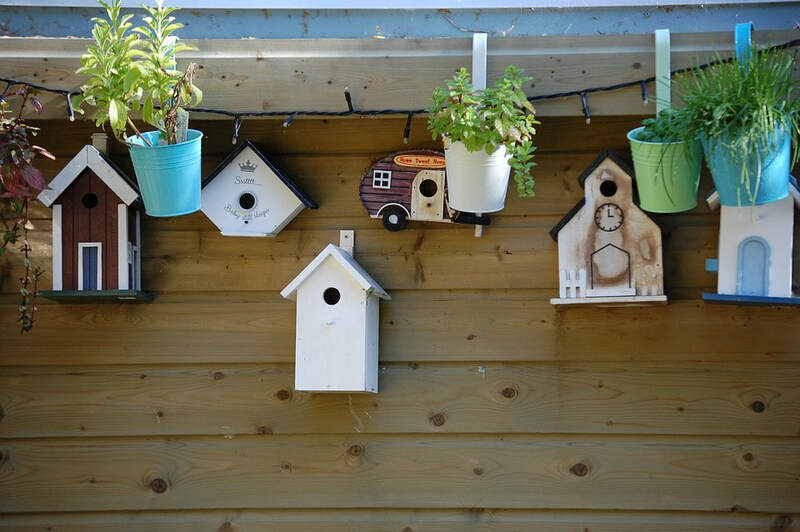 Building a birdhouse is a fun and creative project you can do to enhance your garden and remember your pet at the same time. You can design and decorate the birdhouse in any way that reminds you of your pet, no matter how subtle. For example, you could paint the house the same color as your pet's collar, or if your dog had their own dog house, you can paint the birdhouse as a mini replica of your pet's own dog house. 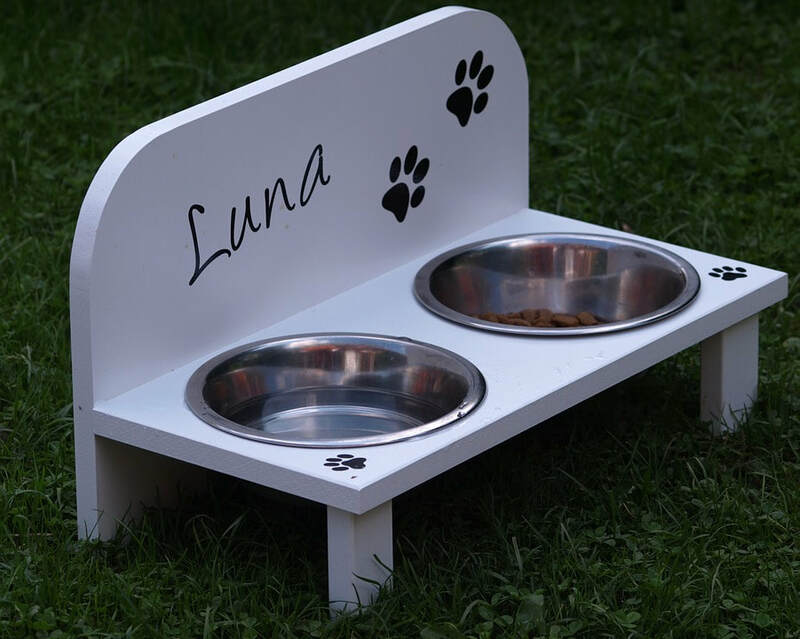 You can also include your pet's name or even a short memorial message on the side or front of the birdhouse so everyone will see it for years to come. 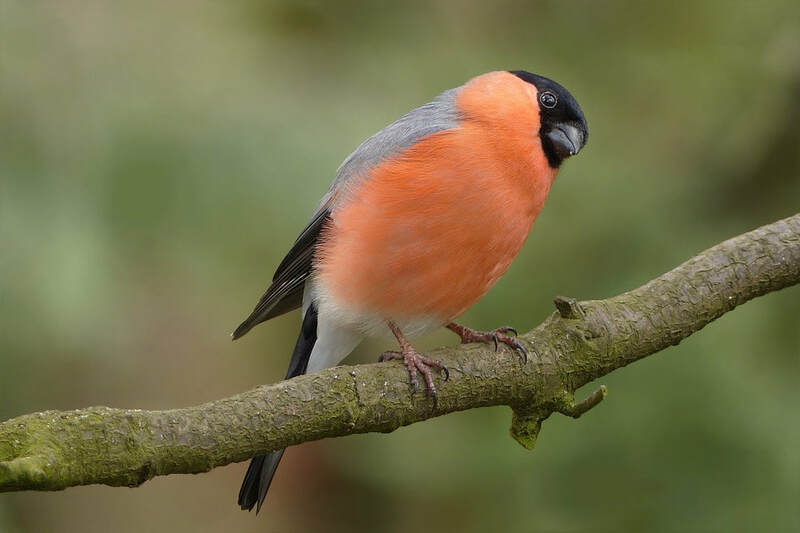 A birdhouse can bring new life to your garden in absence of your pet, and it will be sure to bring back positive memories of your pet when the birds start popping in at their birdhouse every Spring. 43. Hang up some memorial windchimes. Windchimes have a peaceful and spiritual aura about them, and look beautiful hanging up by a garden. 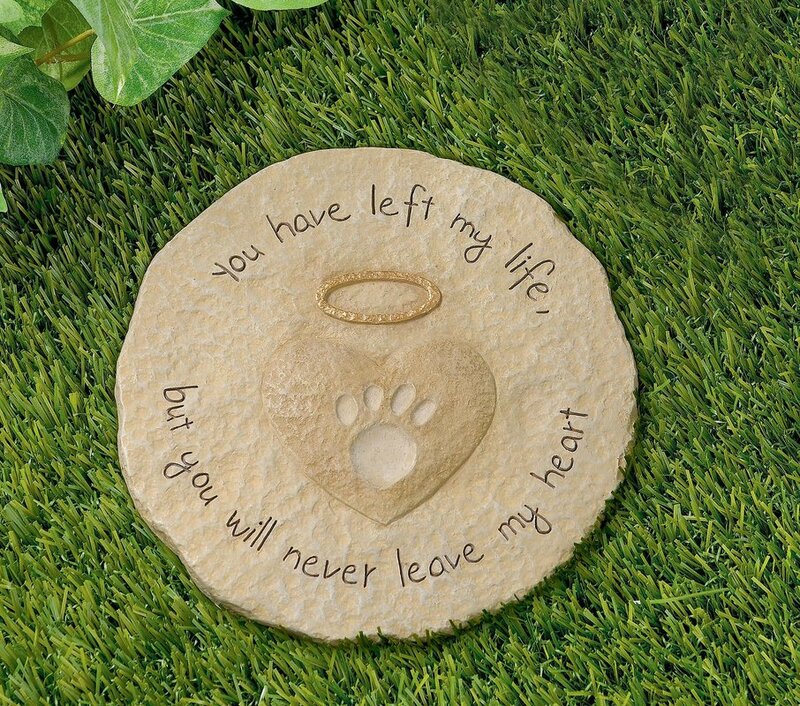 Some (such as the one pictured above) are even made specifically to honor the loss of a pet with a pawprint shaped design and pet memorial quote. There are even more amazing pet memorial ideas that make great keepsakes, but some involve getting something from the pet before they pass, such as a nose print or a tuft of fur. Check out some of the ideas below if you still have that opportunity and want to try something creative with your pet. A paw print painting is as simple as getting some non toxic pet safe paint, dipping your dog's paw in the paint, and placing their paw on a piece of paper. 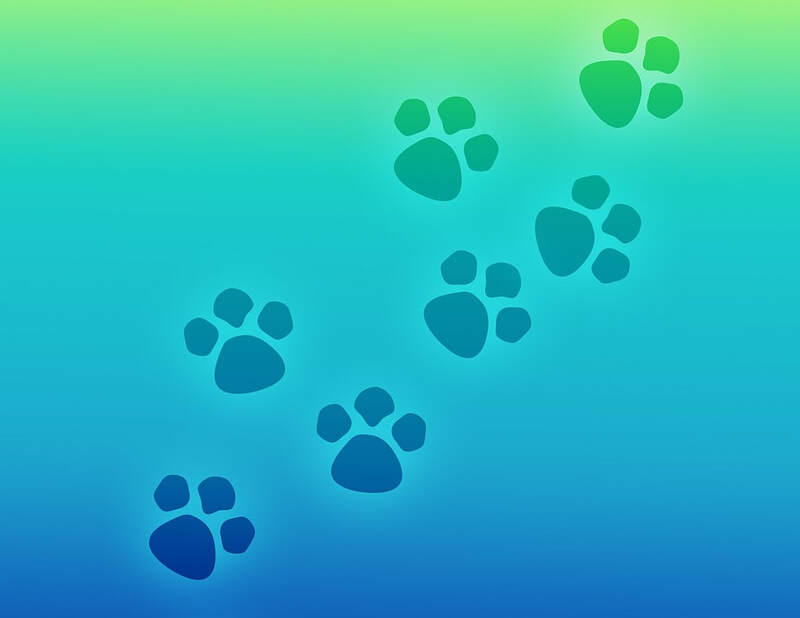 You can do multiple paw prints in all different colors to make a unique and colorful painting. Be sure to wash your dog's paws thoroughly after painting their picture. 2. Teach your pet to paint. A more advanced version of the idea above is to teach your pet to take a paintbrush in their mouth and touch it to a canvas to paint their own picture! 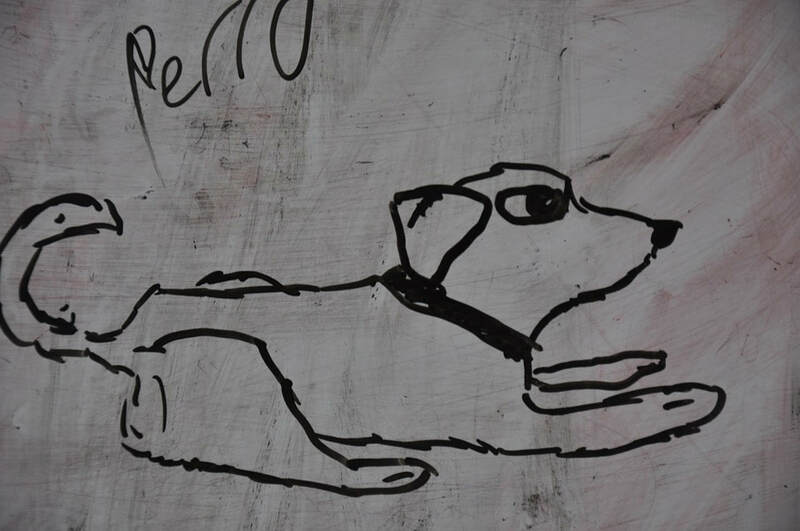 This isn't necessarily limited to dogs either; birds, rats, guinea pigs, and other animals have even been trained to pick up a paintbrush and create their own masterpieces. If you have a smart pet and want to teach them to paint their own picture, this could make a really fantastic memorial. A paw print kit is somewhat similar to the paw print painting idea above, but this one provides an option where you can purchase everything you need in one kit. These types of kits use clay rather than paint, which tends to avoid some of the mess associated with painting. 4. Make a felted bead bracelet from your pet's fur. This idea can work after your pet has passed away, if you happened to keep some fur, or if your pet had a favorite bed you could brush off and collect some fur from. However, it is much easier to get fur from your pet while brushing them, or by picking up some discarded hair during the shedding season. 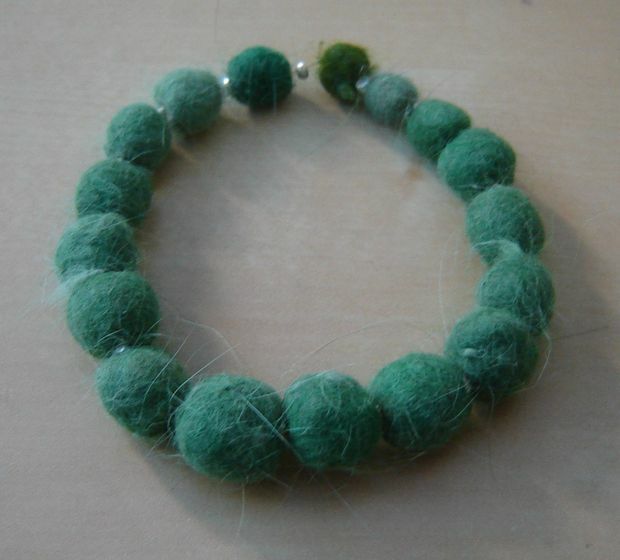 If you want to try something creative and different with all that hair, a felted bead bracelet could be an interesting option. You can dye the beads in a color of your choice, or keep them as your pet's natural fur color. 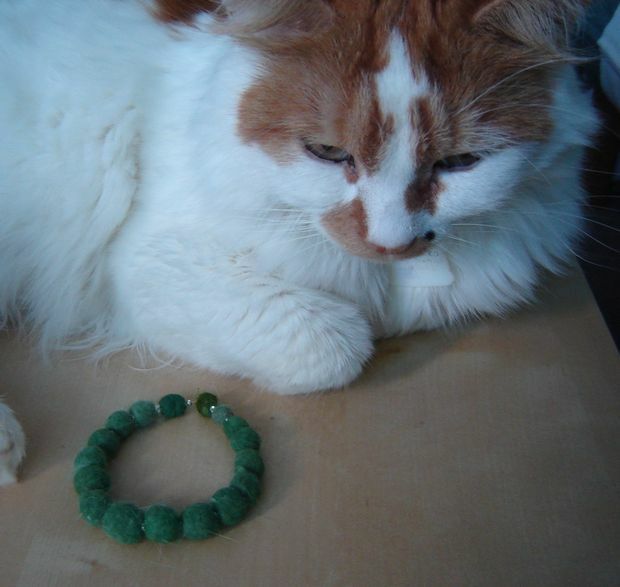 A felted bead bracelet made from your pet's hair can be a treasured piece of jewelry to have when you no longer have all the once dreaded pet hair floating around the house. This tutorial on Instructables explains how to make this project in a step by step process. It's much easier to make than you would think, and the finished product is pretty creative! 5. Take lots of photos while you can! Pictures are one of the best ways to bring back the fondest memories of your pet. Always take lots of pictures of your furry family while you can. If your pet has any funny antics that make you laugh, these are great things to get on video, so your pets can continue to make you smile long after they're gone. Lifetimes are limited, but memories are forever! 6. Earn titles or certificates with your pet. Many people associate titles as just ribbons for winning a dog show, but they are so much more than that. Titles and certificates signify a partnership and bond between the owner and pet, and recognizes all the hard work that the pair has put in together. 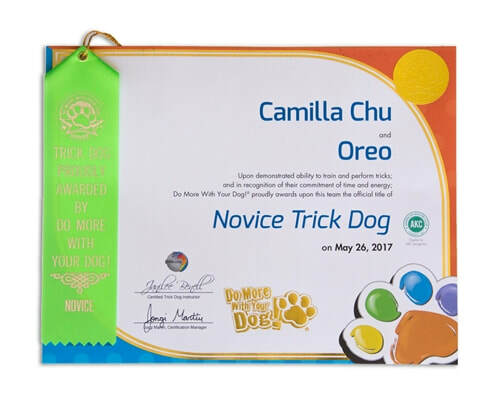 You can also earn trick titles from your home by teaching fun tricks and submitting a video (trick titles can also be earned by all types of animals, not just dogs!) When you look back at your pet's life in the future, the titles and certificates earned by the two of you is bound to be a positive memory of your life together. Photos are one of the best ways to keep the memories of your pet close and fresh. There are countless ways to preserve and display the best photos of your pet. Whether you put together a scrapbook, digital slideshow, put up a wall display of photos in your home, or even just set out your favorite photo in a frame on your shelf, having photos of your pet are a great way to keep their memory in your home, no matter how long they're gone. If you're trying to help your kids accept the loss of a family pet, choose one of the creative, DIY type of projects from this list. Working together as a family to make something in honor of your pet can be very fulfilling for kids. Finding a way to honor your pet is a personal thing. Find something that really speaks to you and makes you happy instead of sad. For example, if having your pet's favorite things or photos around your home makes you upset, opt to put them away in a time capsule (idea #12 above) and open them in a few years when they can bring back positive memories. 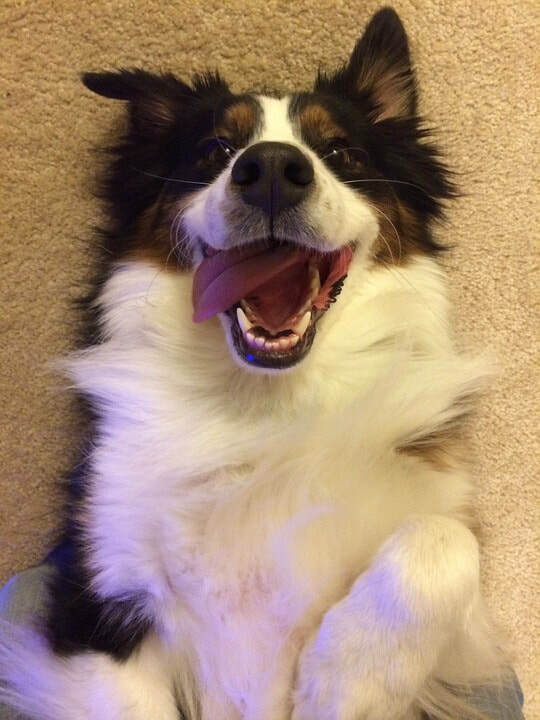 Meet Nana the border collie! Nana is a YouTube star, animal actor, and all around amazing trick dog and companion. From the time she was brought home as a nine week old puppy, this dog has been learning all kinds of incredible tricks. Nana knows nearly every dog trick in the book. From the impressive foot stalls and walking hand stands (aka paw stands), to the equally (if not more!) impressive balancing tricks, there's truly nothing this dog can't do. For good measure, she also likes to throw in some cool frisbee catches, agility, and impressive obedience maneuvers that most average pet owners only dream of. Nana is trained with exclusively positive reinforcement and clicker training. To her, training is just another game to be played with her favorite person. 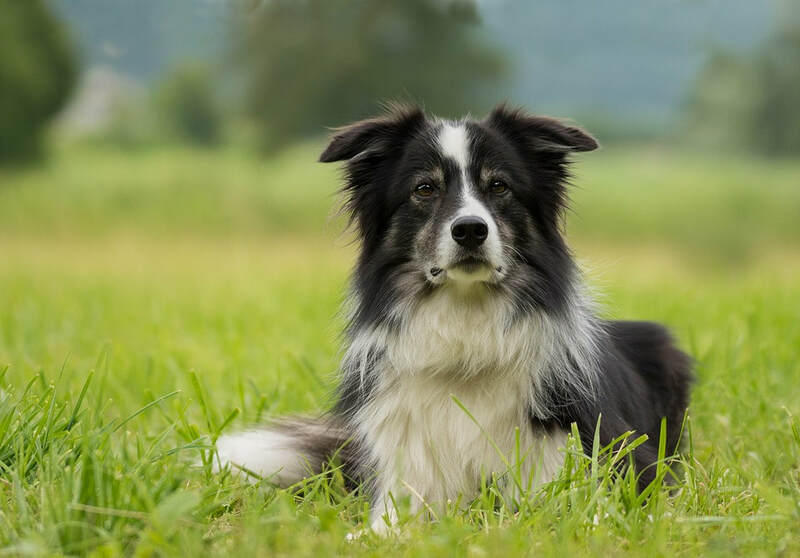 Border collies have an immense desire to work, and trick training is one of many ways to fulfill their intense desire for mental activity and learning. Nana is obviously a very happy and fulfilled dog that truly loves her "doggie job." The video above shows most of Nana's tricks at just 2-3 years old. In the video, she can walk backwards (on four paws and two!) fake limp while walking, pick up a coin and put it in a jar, ride a skateboard, blow bubbles, balance on her owner's feet (aka a foot stall) and perform countless more amazing stunts! She also knows all the cute party tricks; weaving through legs, crossing her paws in time with her trainer, wrapping herself in a blanket, playing dead and covering her eyes, and dancing alongside her owner. At such a young age, she knew more tricks than most dogs do in a lifetime! Now, at ten years old, Nana has grown her trick repertoire exponentially, as well as perfected her impressive balancing tricks. The video below showcases some of her more recent (and increasingly advanced) balancing tricks, where she balances everything from dog treats, to books, to glasses of water, all while doing walking handstands, weaving through poles, and standing on her hind legs. Nana also has several furry family members who share her love of learning and trick training. Kaiser the Bengal cat is one of Nana's best friends. Just like his border collie sister, Kaiser has an impressive repertoire of tricks. His trick list includes playing dead, walking backwards up the stairs, riding a skateboard, foot stalls, and so much more! He can even do backflips and growl on cue! In addition, he also walks on a leash, runs agility courses, and can perform tricks at a distance from his trainer. Like Nana, Kaiser is a proven animal actor and all around amazing and talented purrformer (sorry, couldn't resist!) In his free time, he enjoys playing in the water like a dog, and hanging out with Nana and his adorable rattie buddies. In addition to Nana's best buddy Kaiser, she also has a few less traditional friends. While they are a little smaller than the average dog, these little guys are just as cute, and have quite a few tricks up their sleeves as well. These adorable little rats can raise flags, weave poles, play fetch, paint, walk a tightrope, and also have a variety of impressive jumping tricks to show off. They are also quite helpful around their home and can go shopping for their own treats, help decorate the house, fetch the mail, weigh themselves, and even fetch a tissue for their owner. Nana, Kaiser, and their little friends often make cute guest appearances in each others' trick videos. This talented crew can also be seen performing together while acting out mini movies, such as Home Alone With Nana and Kaiser. They can even be seen competing against each other in a fast paced Dog vs. Rat vs. Cat Trick Contest, in which they compete in an epic head to head battle to see which animal takes the top spot for most amazing tricks. You can follow Nana and the rest of her furry family via YouTube (@NanaBorderCollie) or visit their website at UseYourClicker.com. 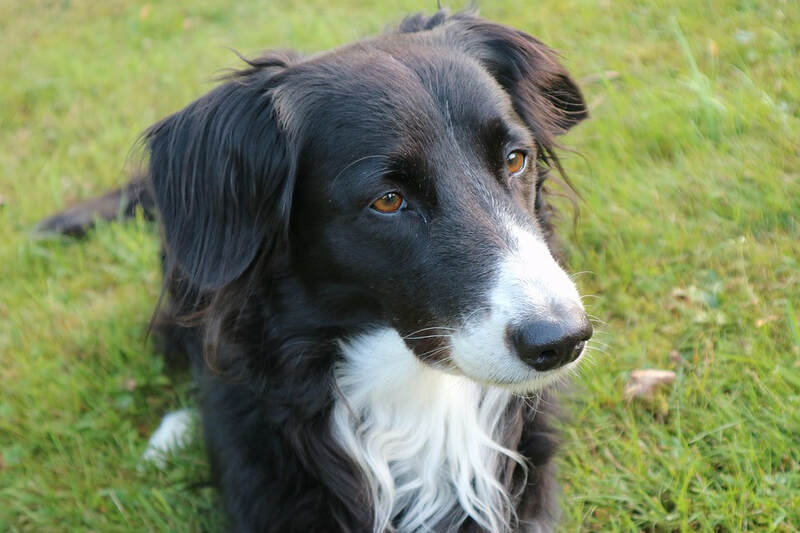 Welcome to the Border Collie Blog!